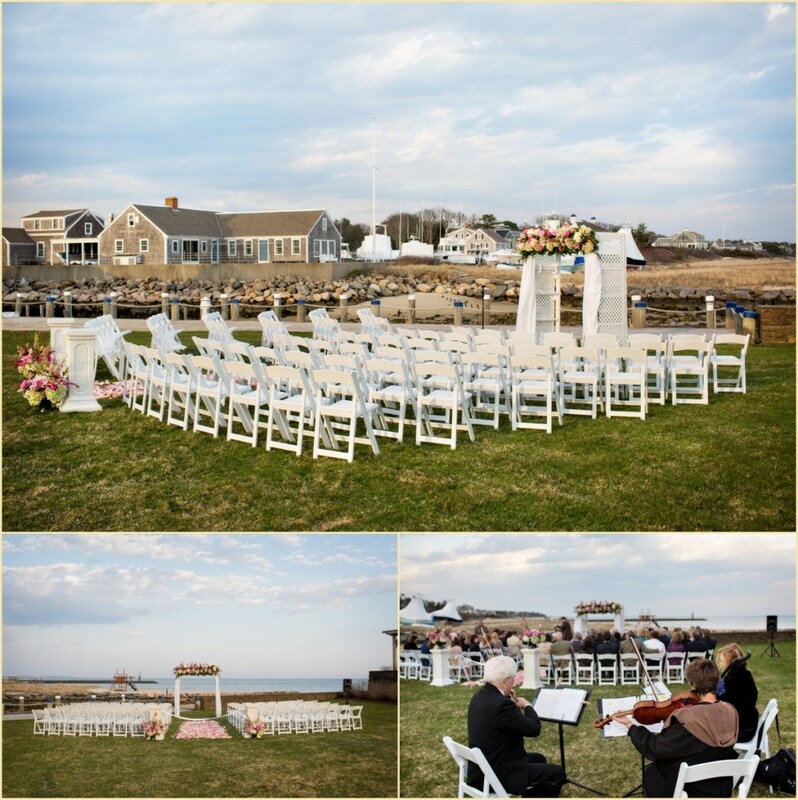 There are so many fantastic New England wedding venues perfect for a seaside wedding — whether you’re right outside of Boston on the North Shore, south in Rhode Island or on Cape Cod! 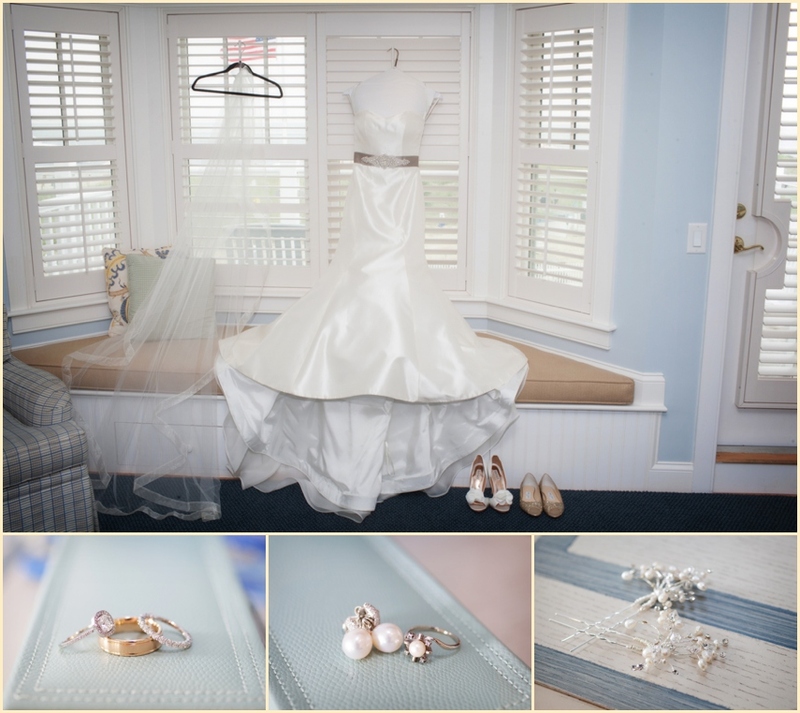 Christina and Tony chose the beautiful Chatham Bars Inn for their summer wedding on the Cape, an elegant beach wedding with lots of blue, white and natural elements. 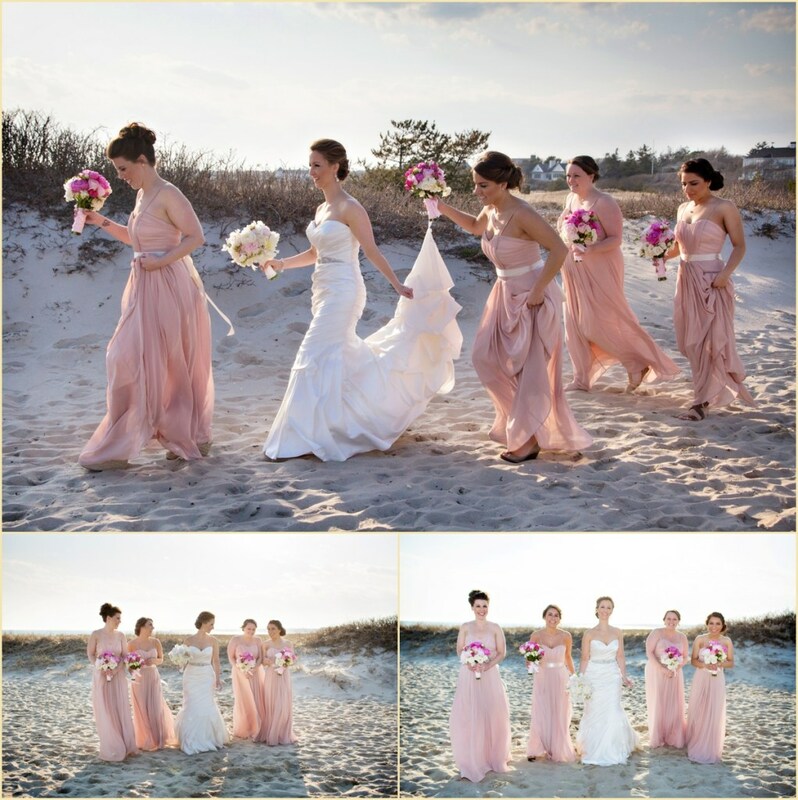 Christina and her bridesmaids began the day getting ready in a suite above the Beach House Grill, with a great view of the ocean right outside. 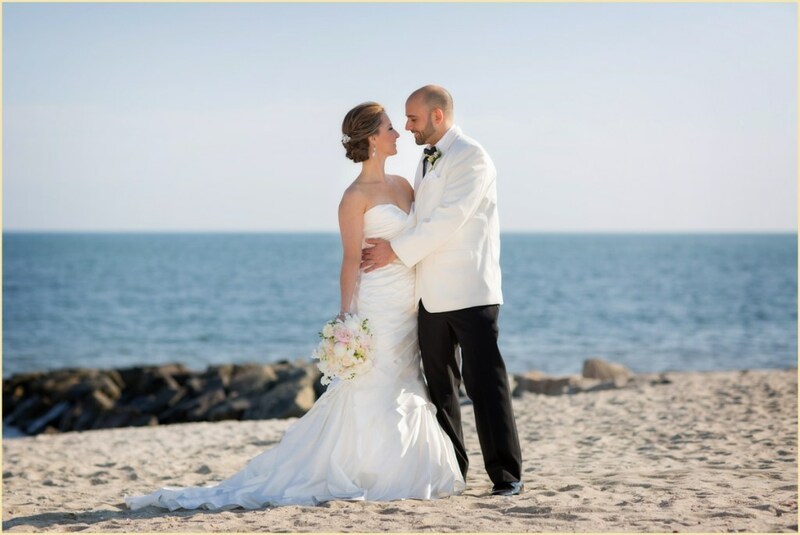 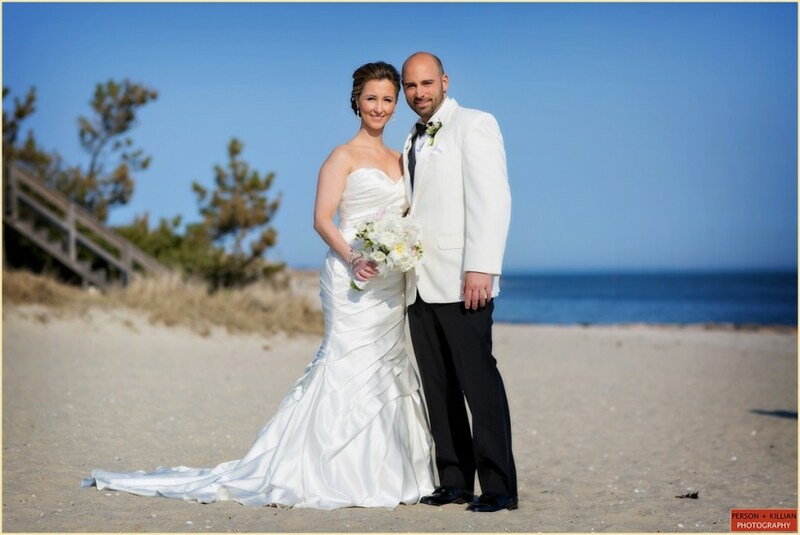 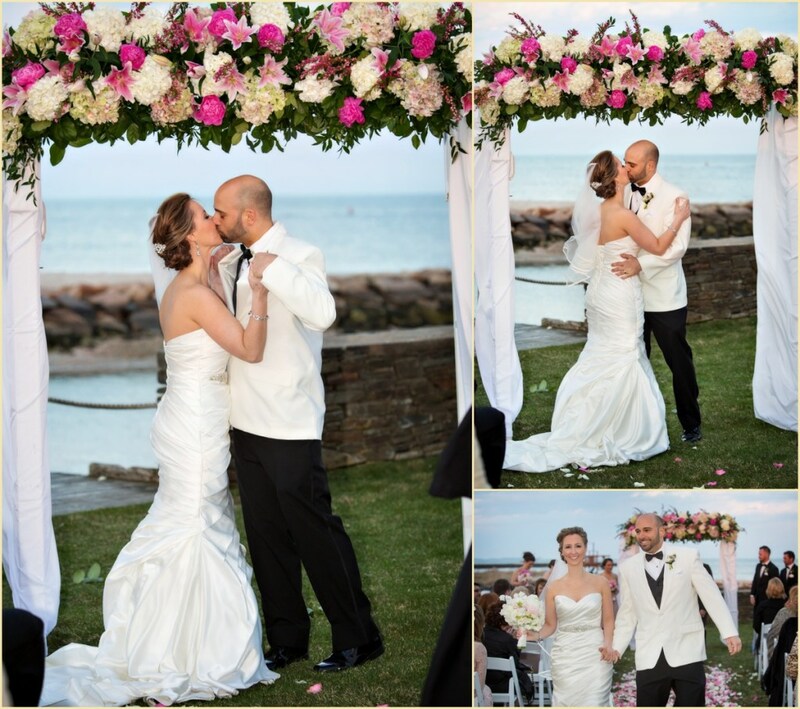 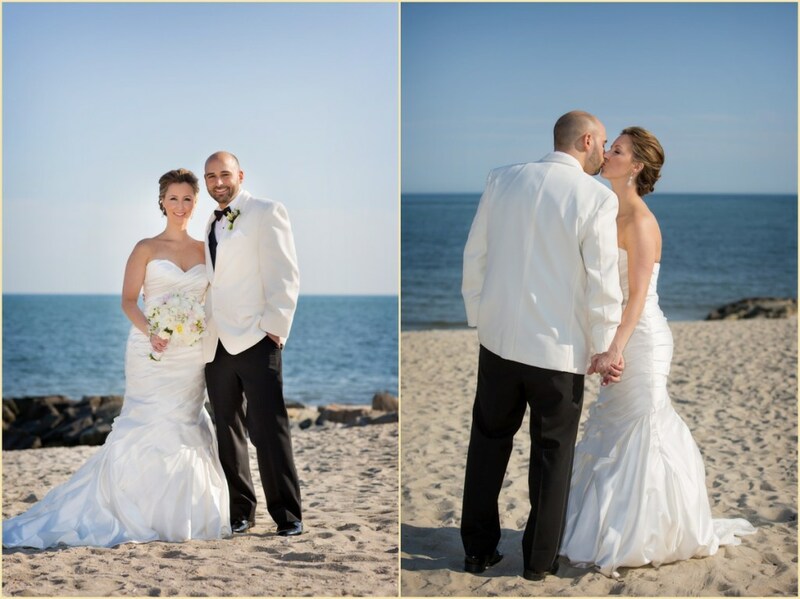 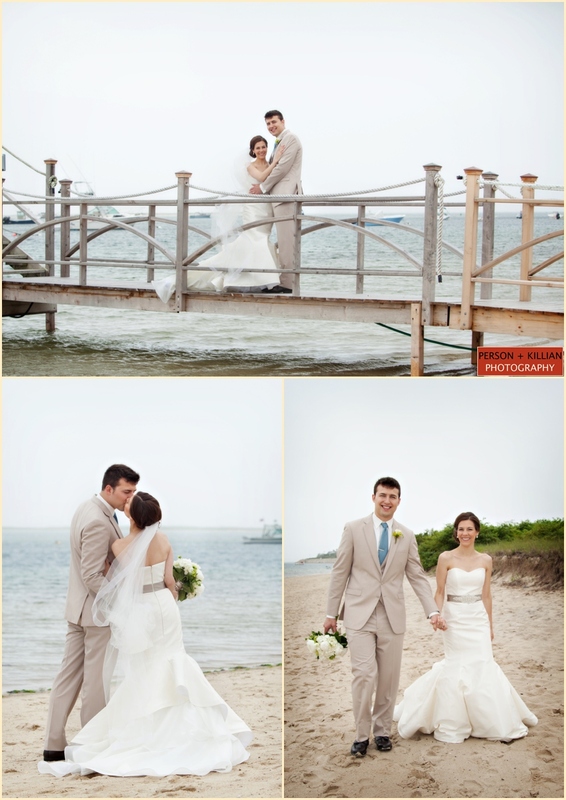 Christina’s gown was perfect for a summer beach wedding — a strapless mermaid cut dress with an embellished silver belt. 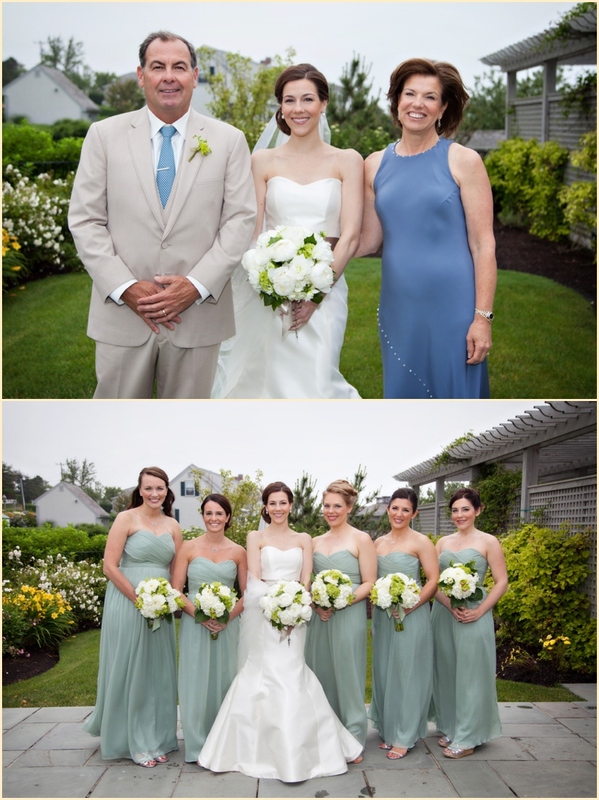 The bridal party wore strapless seafoam green dresses, and Christina gifted necklaces and matching clutch purses to all the ladies before the wedding. 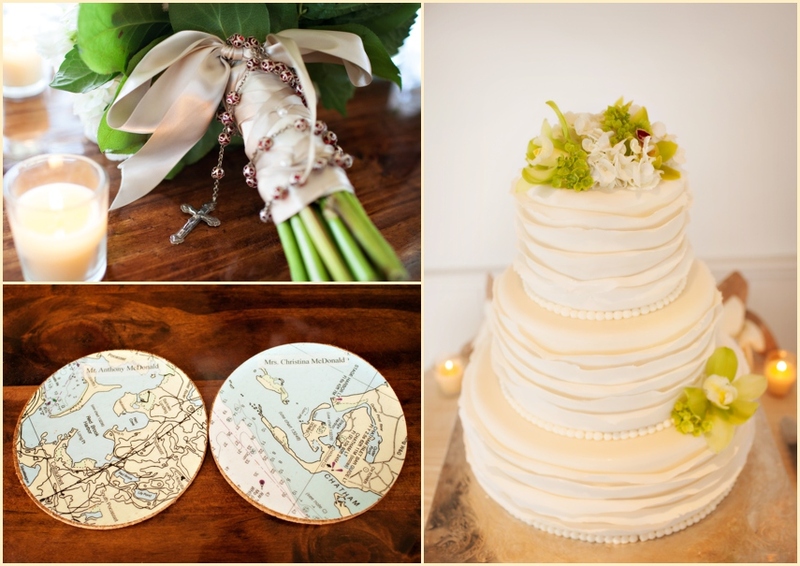 All of the women carried white and green summer flowers, tied with a matching seafoam ribbon for the bridesmaids and a creme-colored ribbon for the bride. 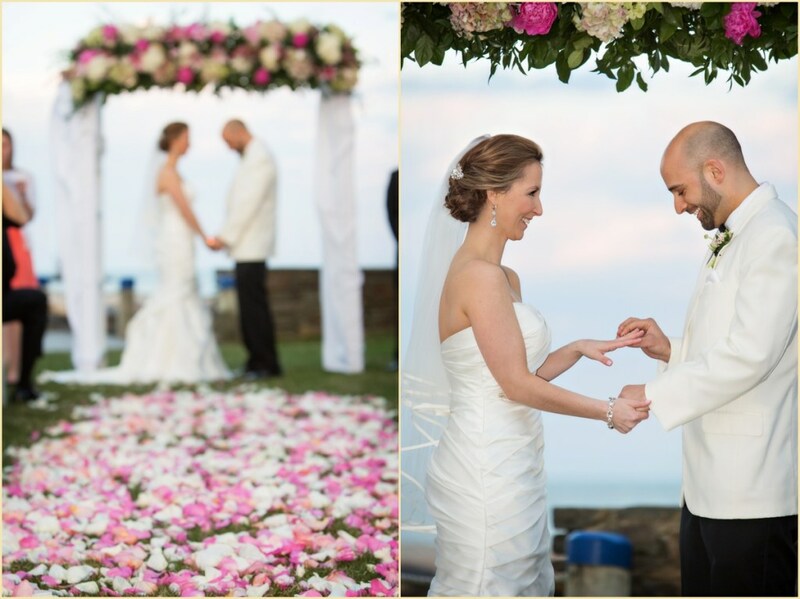 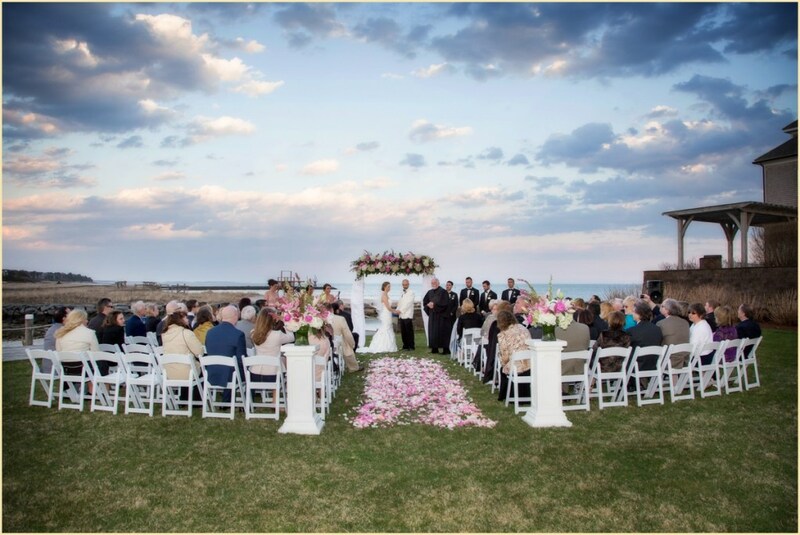 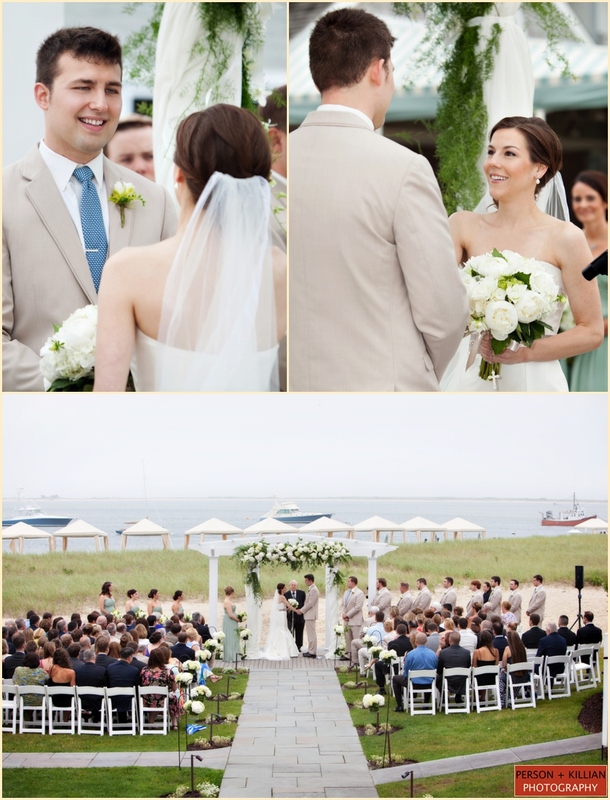 The outdoor ceremony took place on the Chatham Bars Inn lawn, overlooking the ocean. 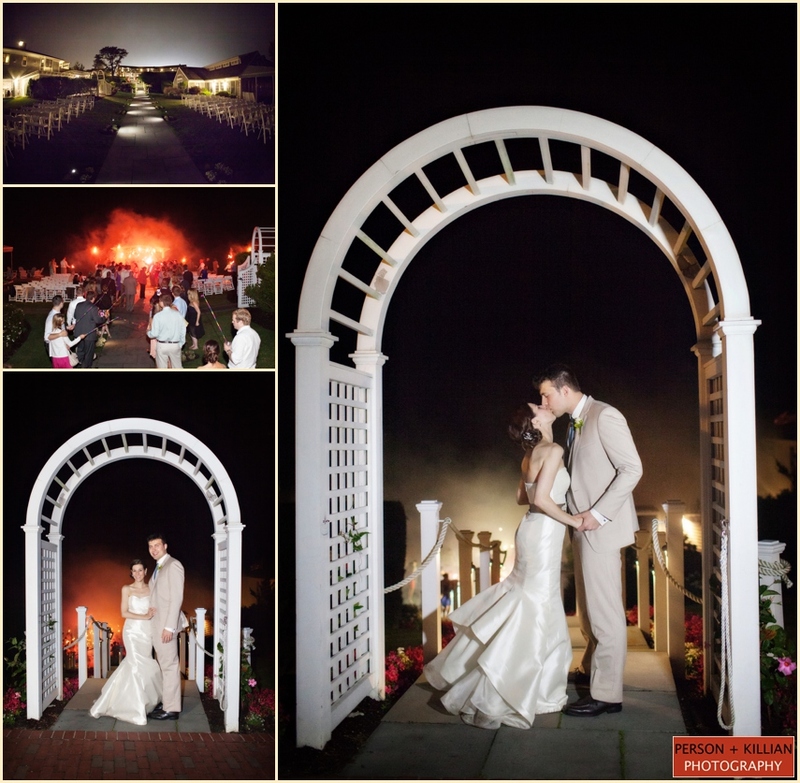 Christina and her father made a grand entrance down the staircase towards the beautifully decorated white and green archway for the ceremony. 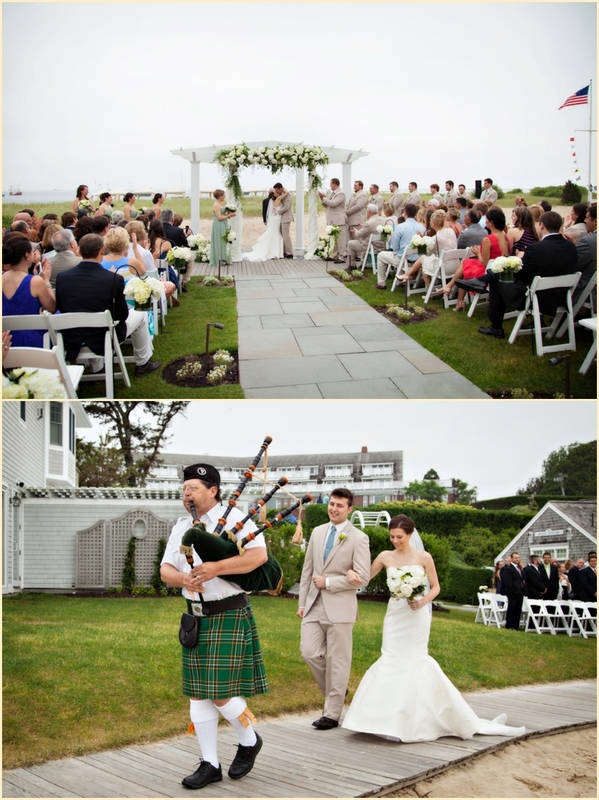 Following the “I do”s, a traditional Scottish bagpiper lead the happy newlyweds across the Chatham Bars Inn boardwalk down to the beach for some formal pictures with the couple, their wedding party and families. 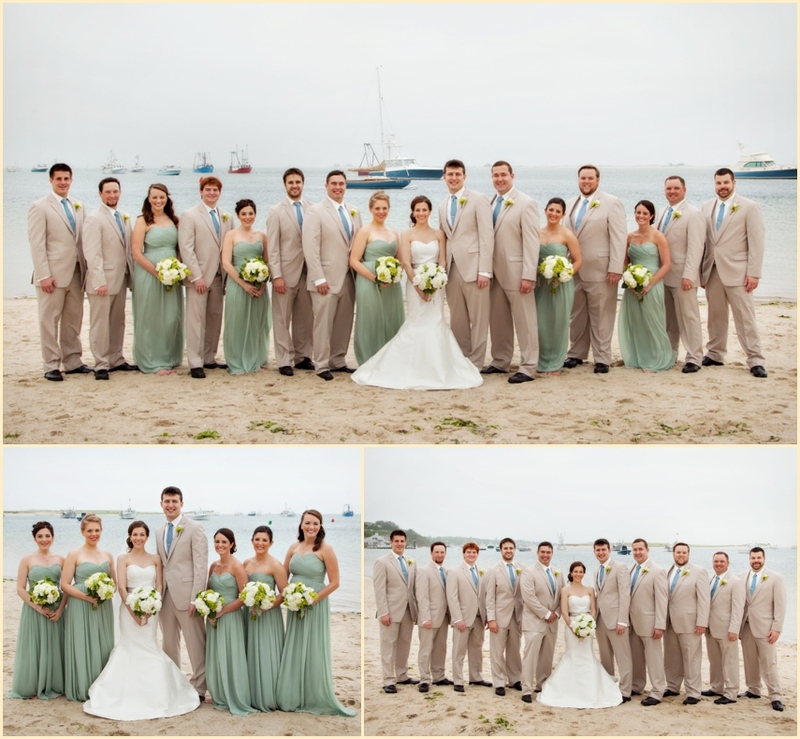 We got some great photographs of the bride and groom with their bridal party right on the water’s edge, with classic Cape Cod boats floating just behind in the background. 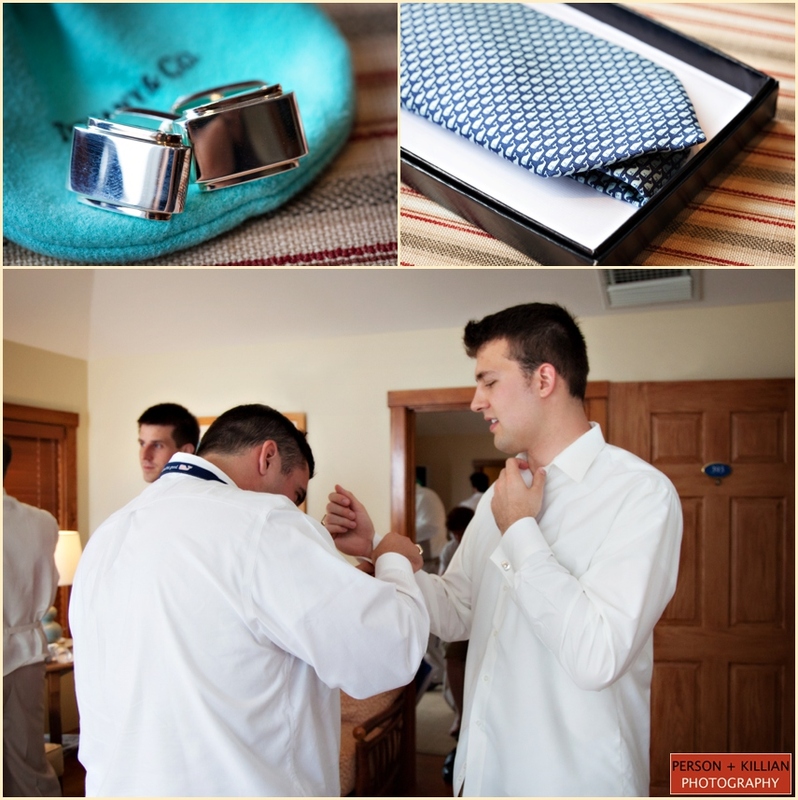 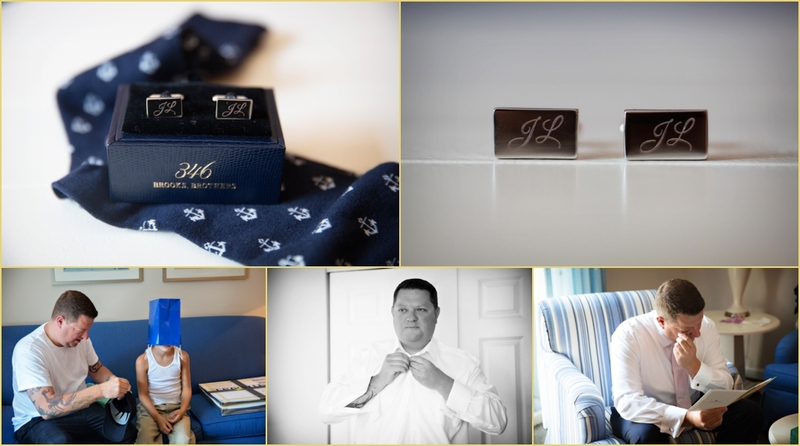 The groom and groomsmen were dressed in tan suits, with white shirts and a bright blue tie for just a touch of nautical colors. 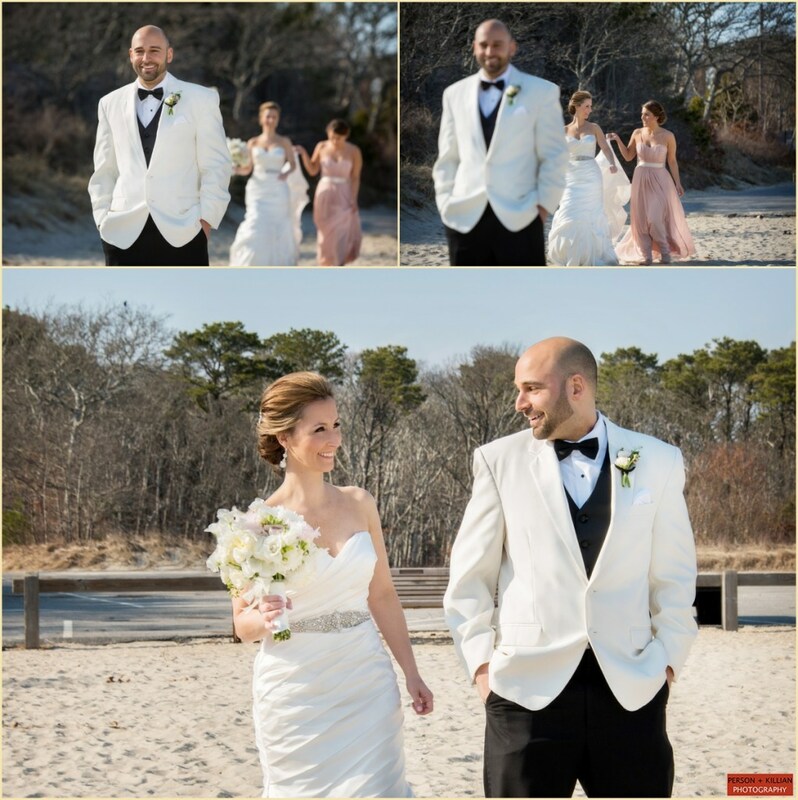 Before heading to the reception, we had some time to spend alone with Christina and Tony to take some great beach wedding pictures on the footbridge over the water, in the grassy beach dunes, and along the classic New England boardwalk before heading inside to the reception. 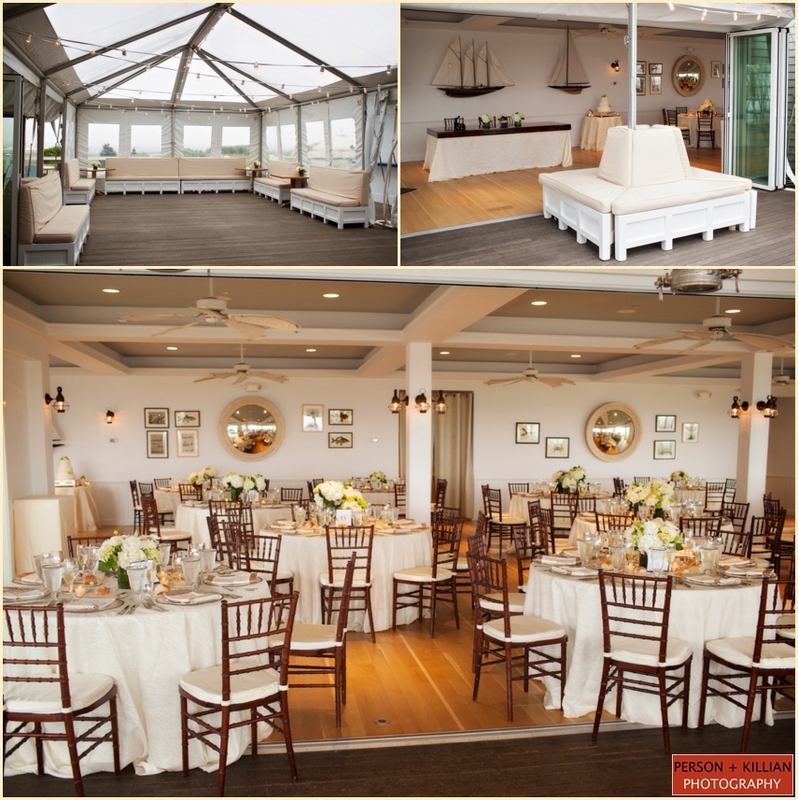 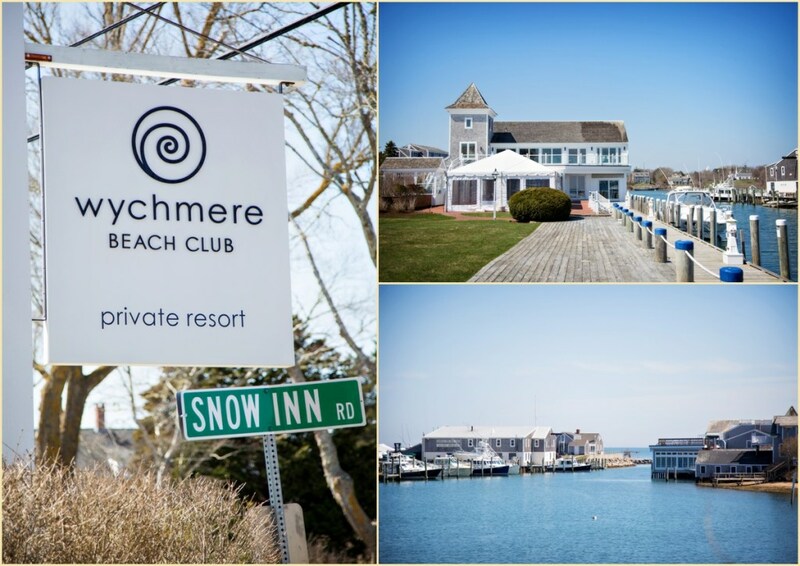 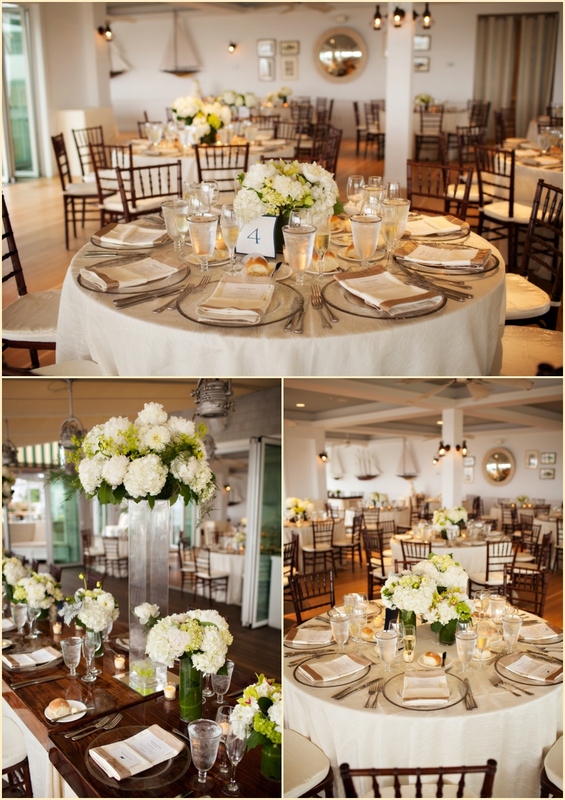 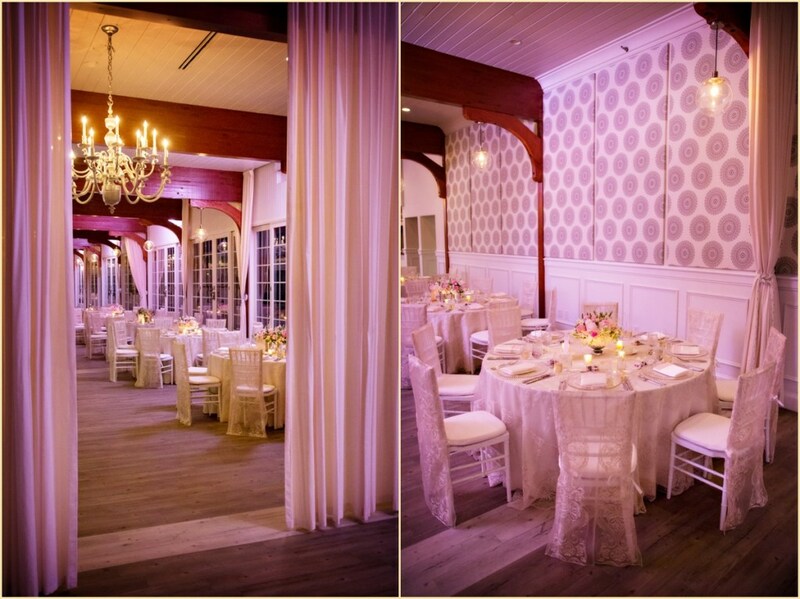 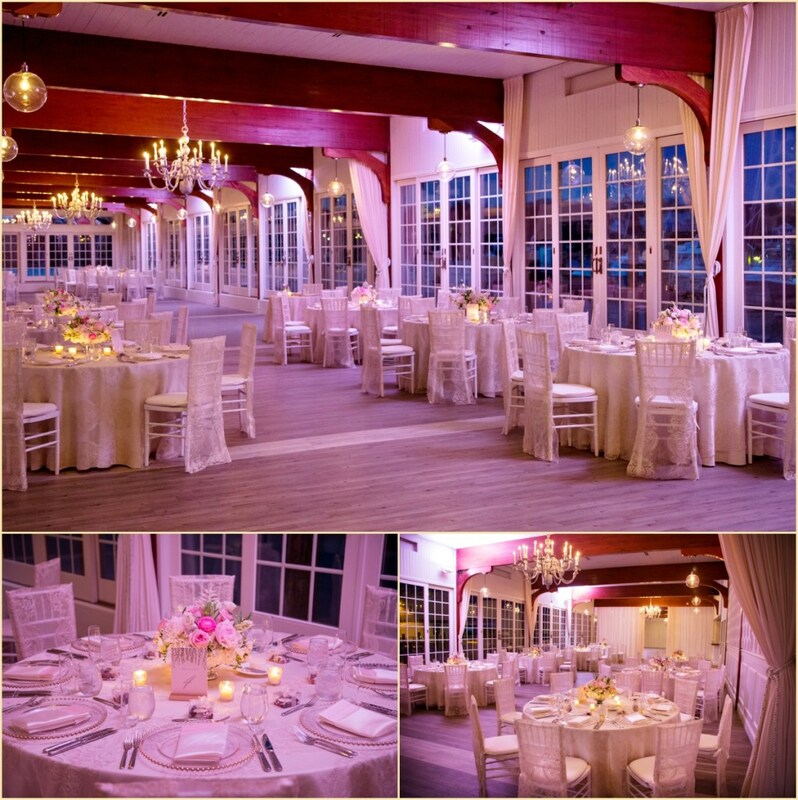 The Chatham Bars Inn Beach House was transformed into a beautiful wedding reception space with natural creme-colored linens, clear silver-lined charger plates and dark natural wood ballroom chairs. 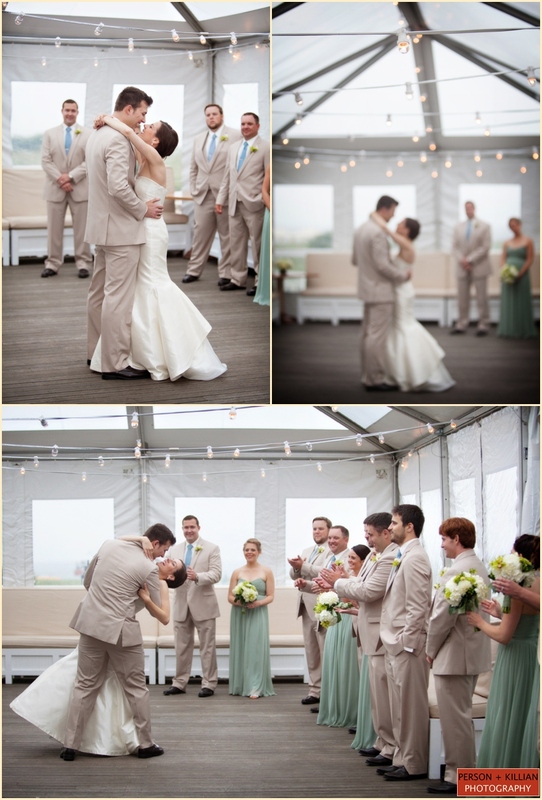 White and green flowers on all the tabletops added a pop of color to the Beach House, and the clear tent over the outdoor patio made a perfect dance floor for the night’s party. 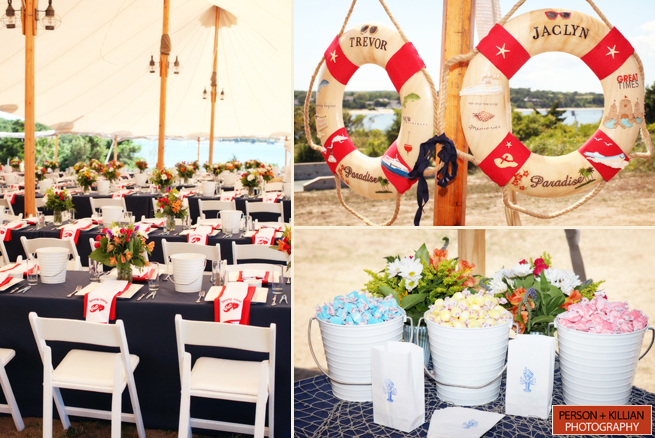 Guests were signing classic Cape Cod lobster buoys in lieu of a guest book, and a traditional lobster trap was set out for gifts and cards. 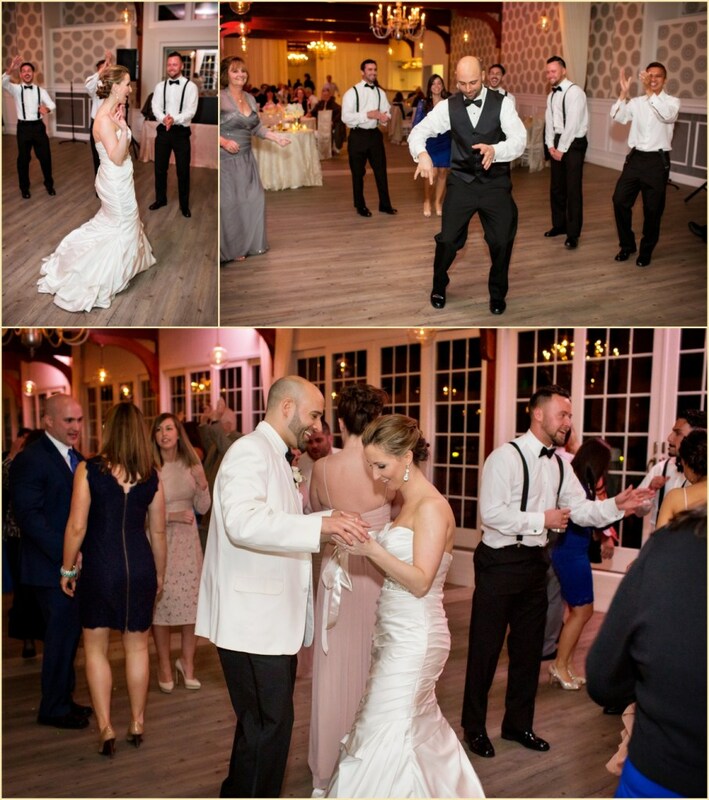 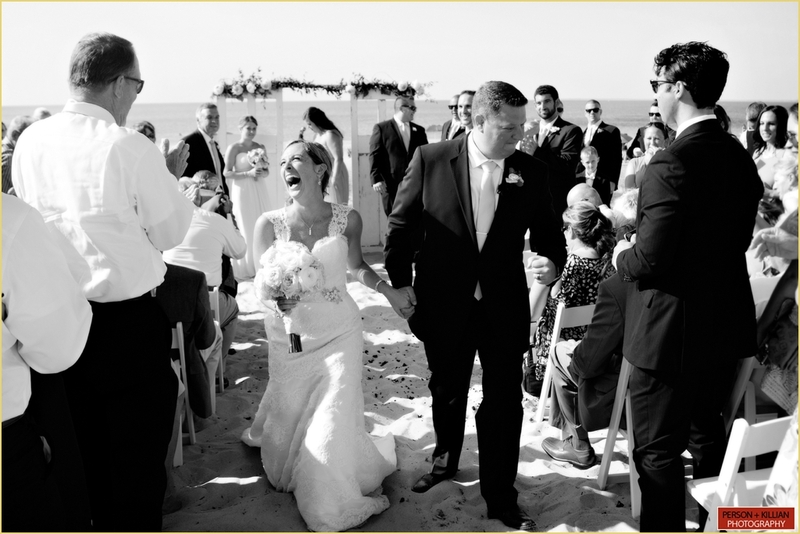 Following the last dance, the band announced the surprise sparkler exit where guests walked from the Beach House Grill to the after party at The Monomoy. 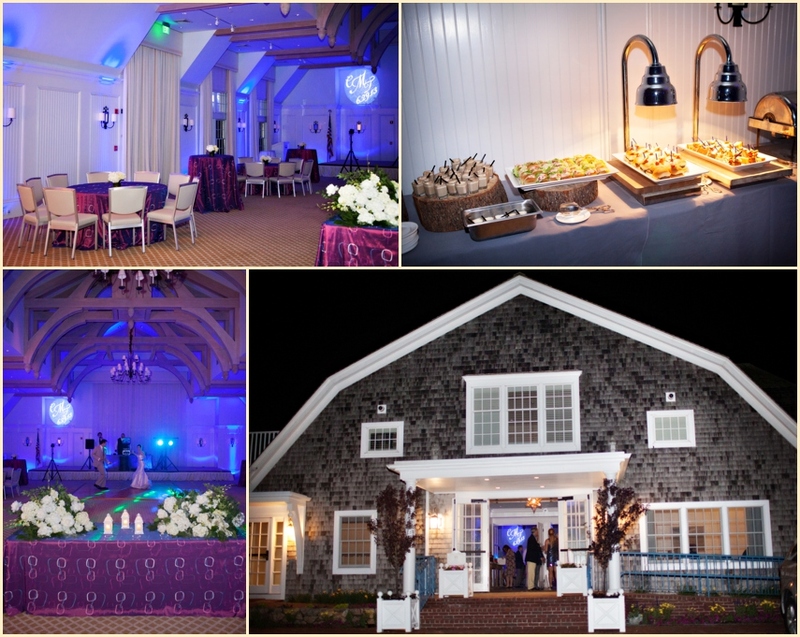 Guests enjoyed night snacks including mini shakes and burgers and hit the dance floor with music from a DJ. 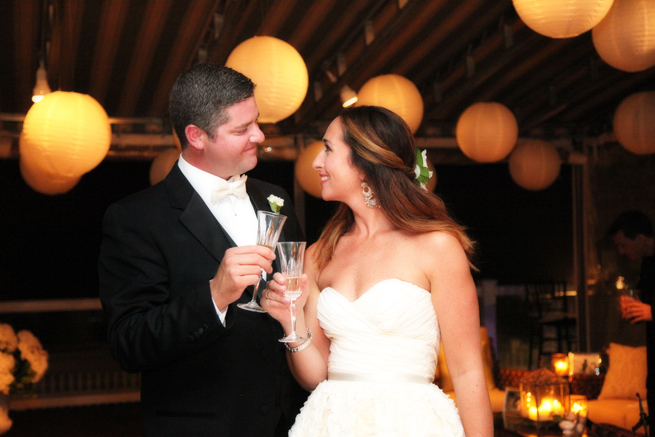 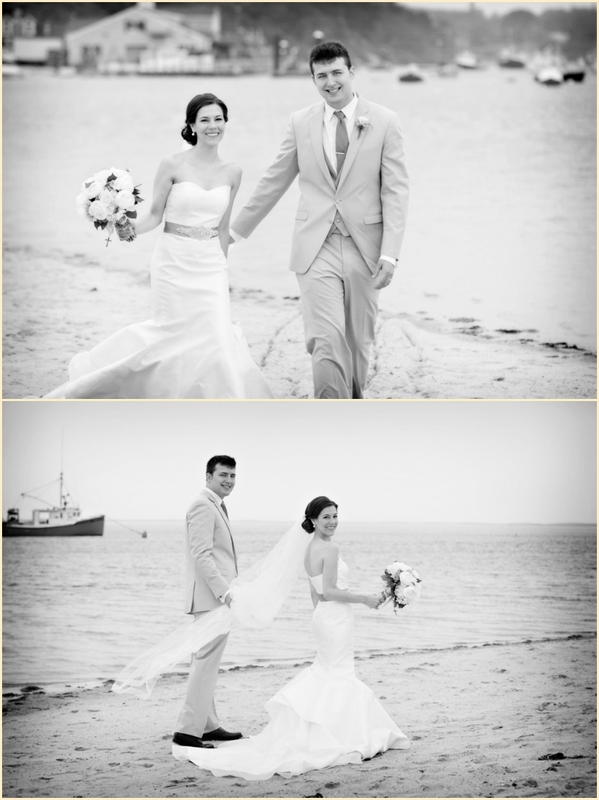 We loved the elegant twist this couple put on a classic beach wedding theme. 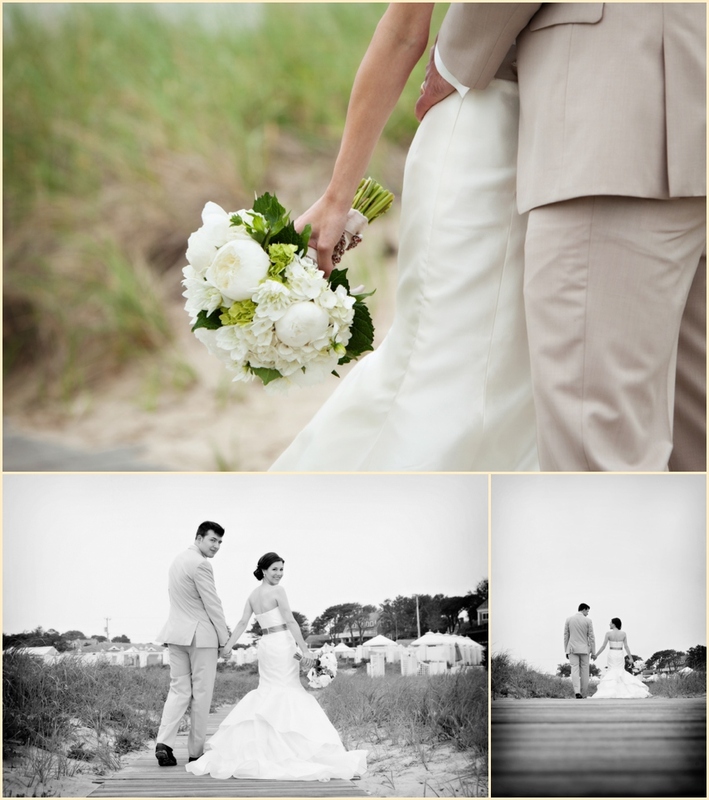 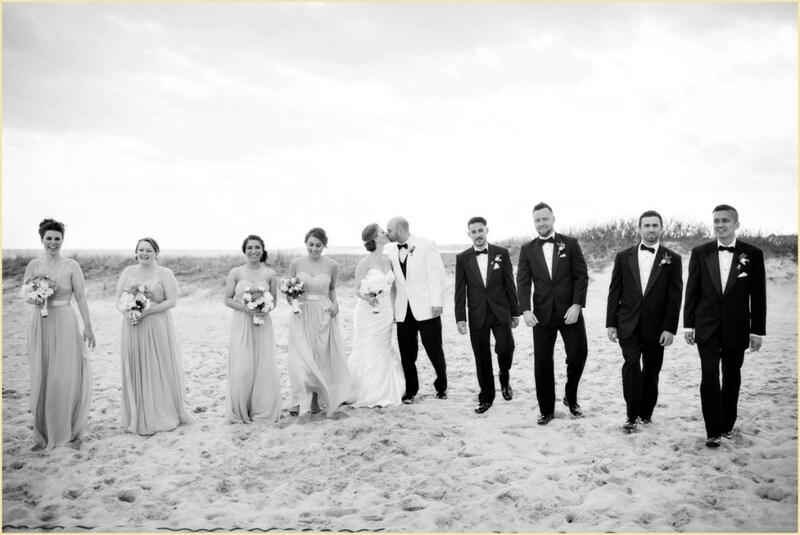 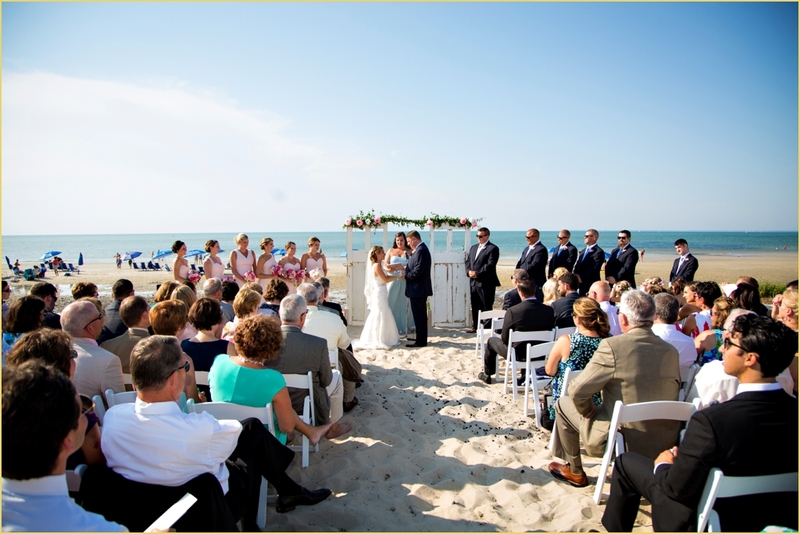 It had all the right touches of summer, sand, and the seaside for a great Cape Cod wedding. 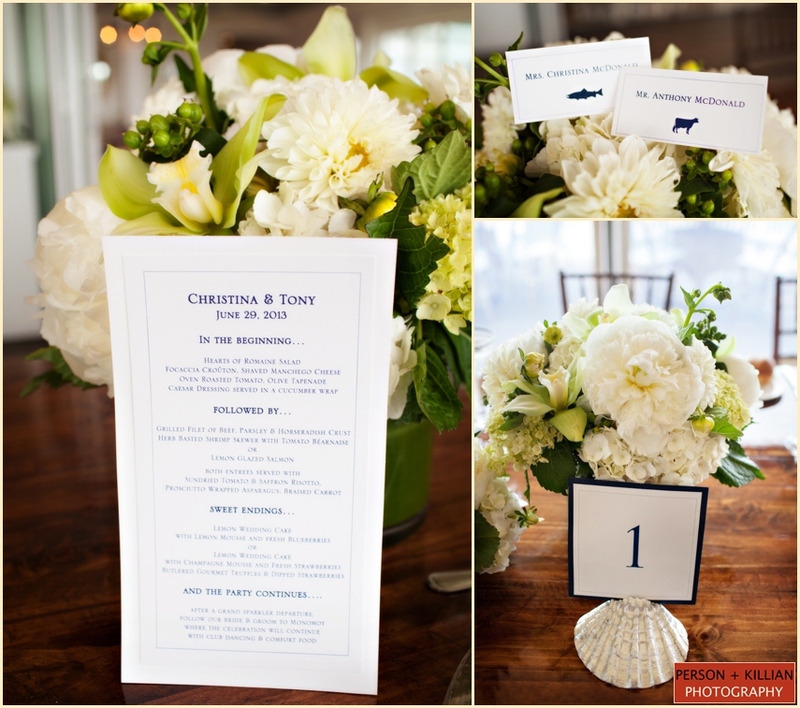 Congratulations Christina and Tony! 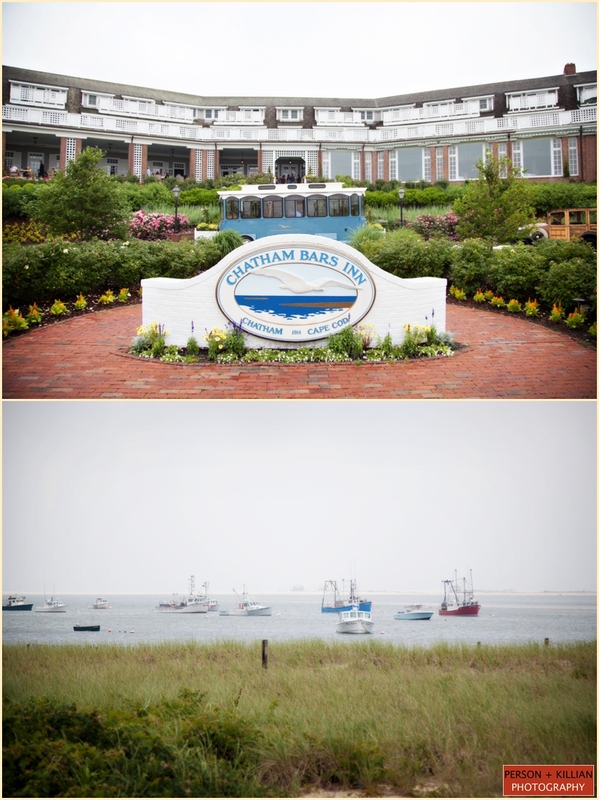 Also, a big thank you to Allison Wildes Liset who planned this beautiful wedding and the team at the Chatham Bars Inn! 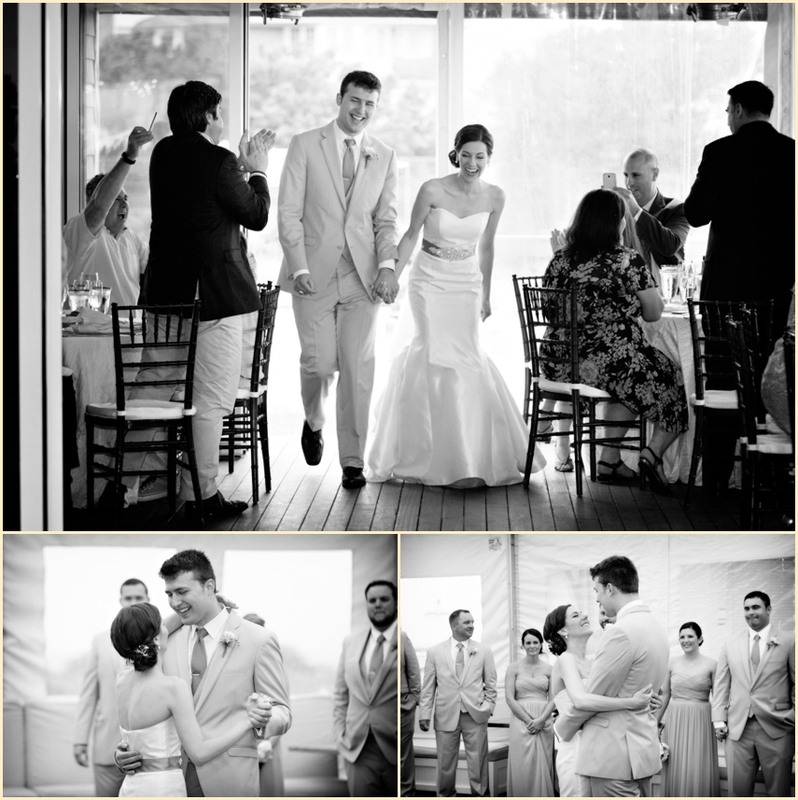 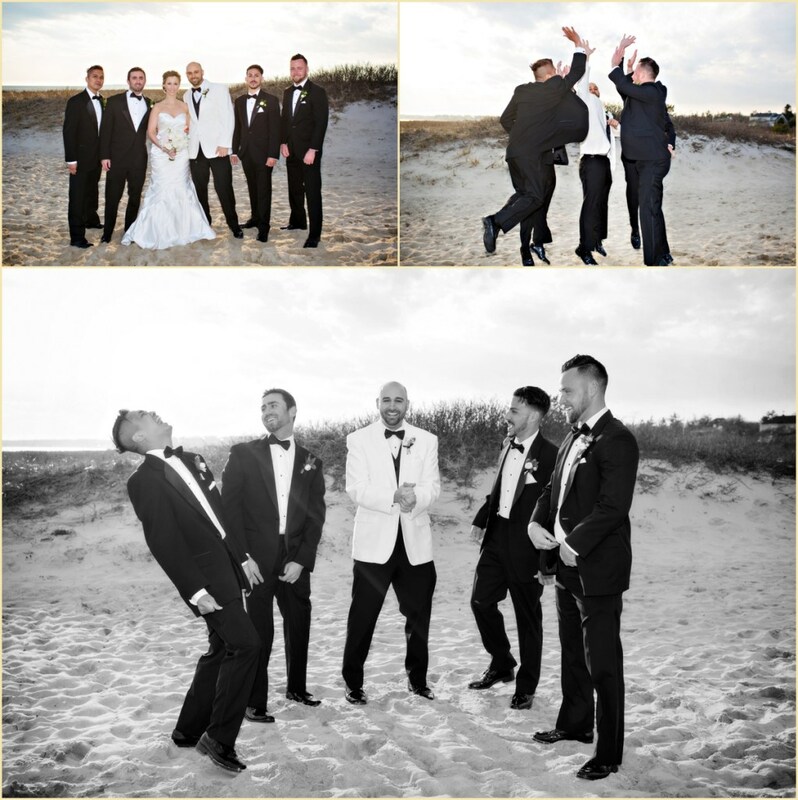 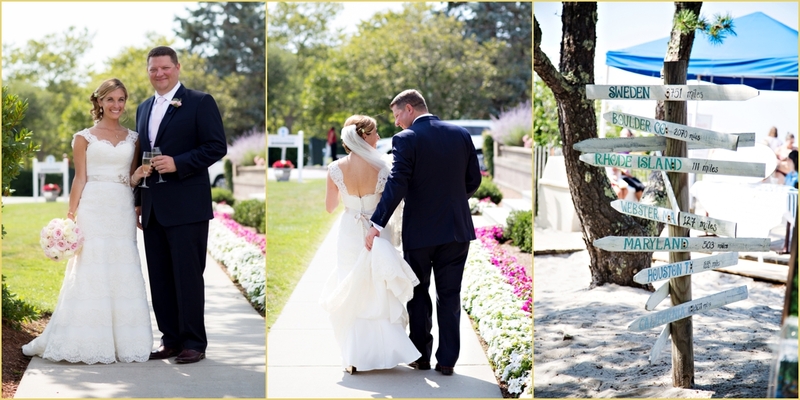 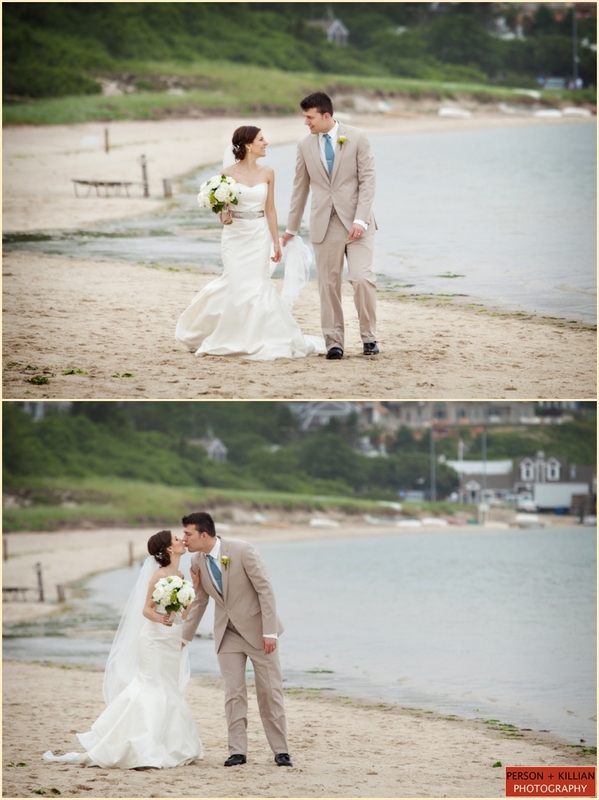 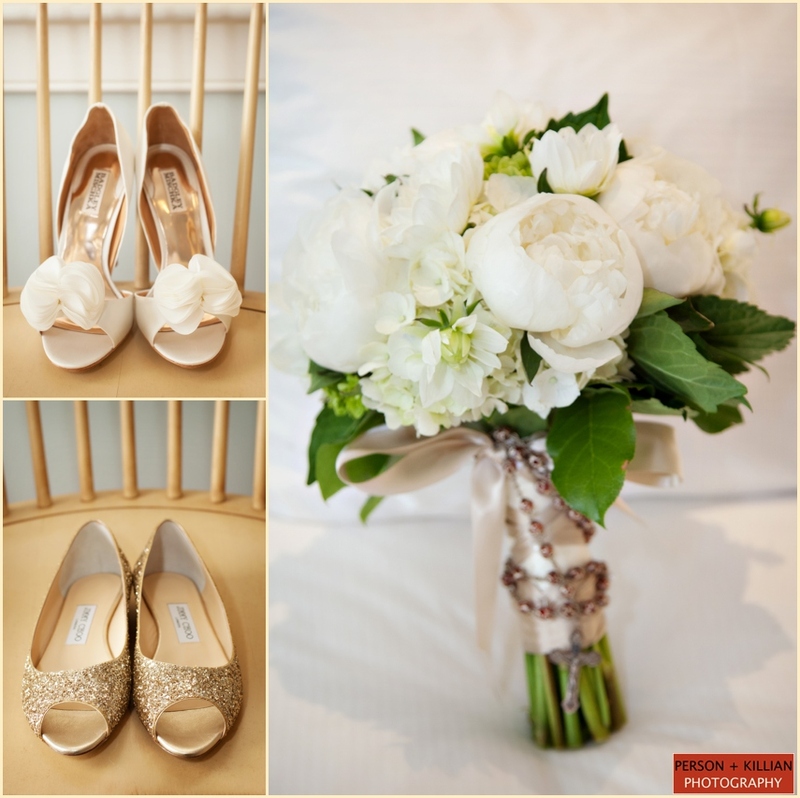 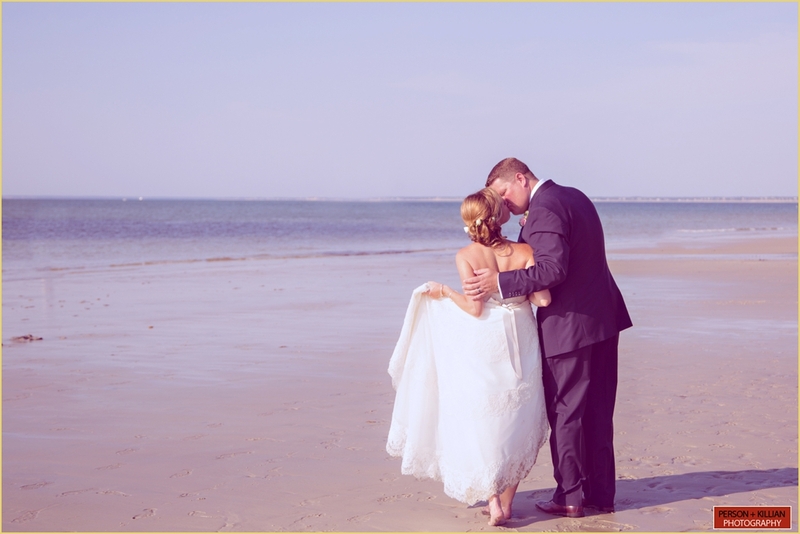 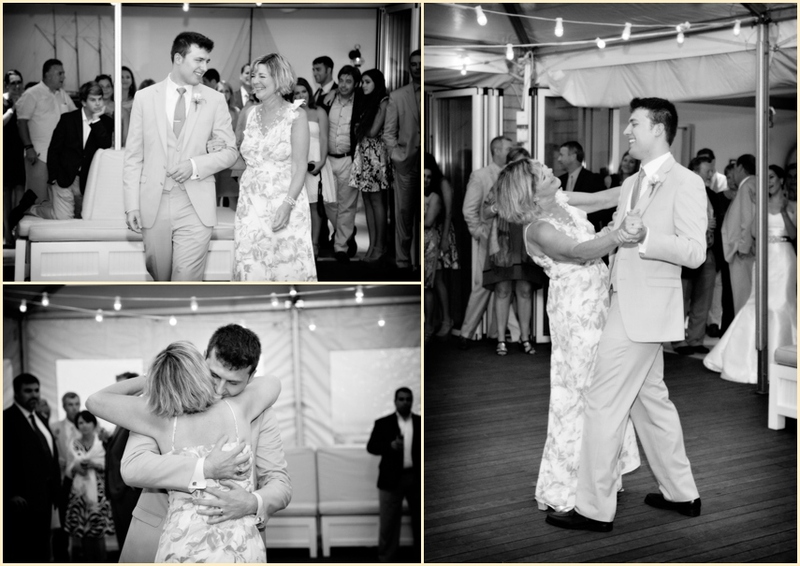 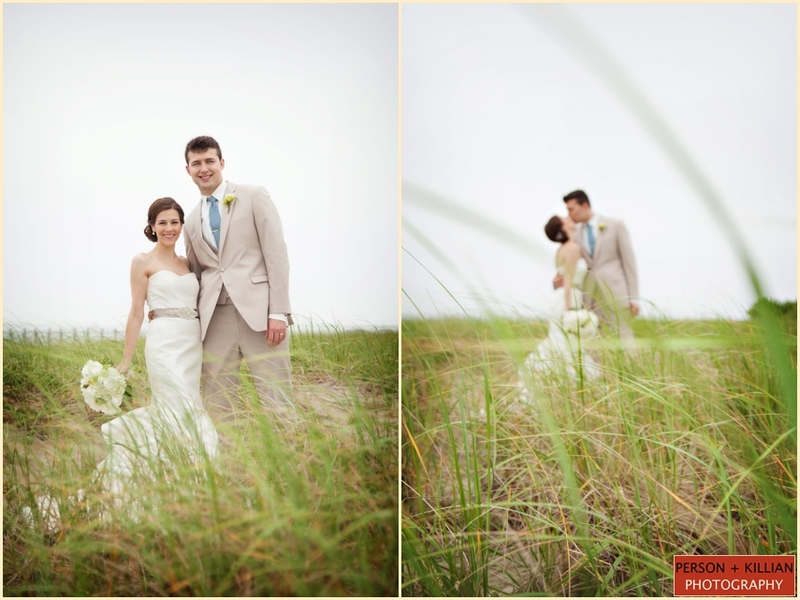 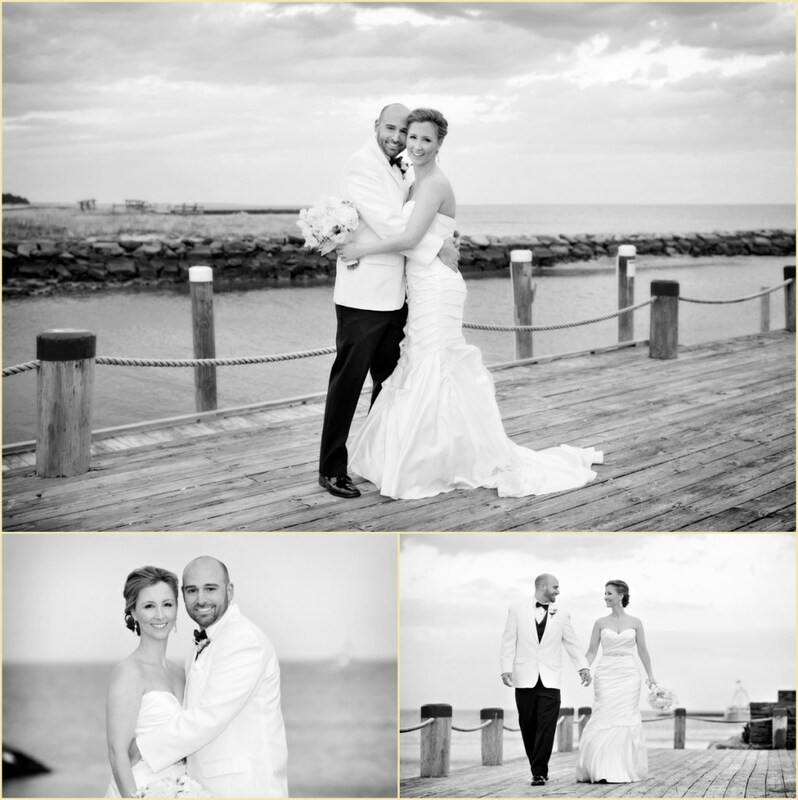 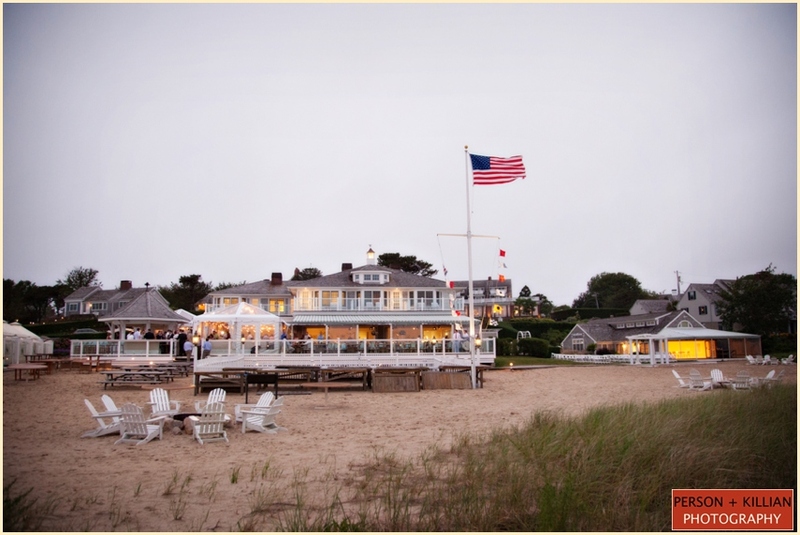 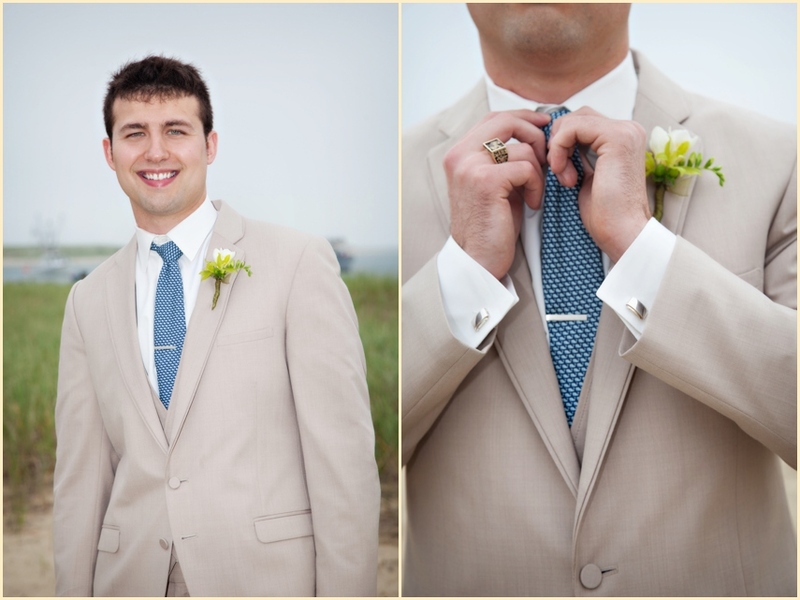 Person + Killian Photography recently had another great wedding at the Chatham Bars Inn on Cape Cod. 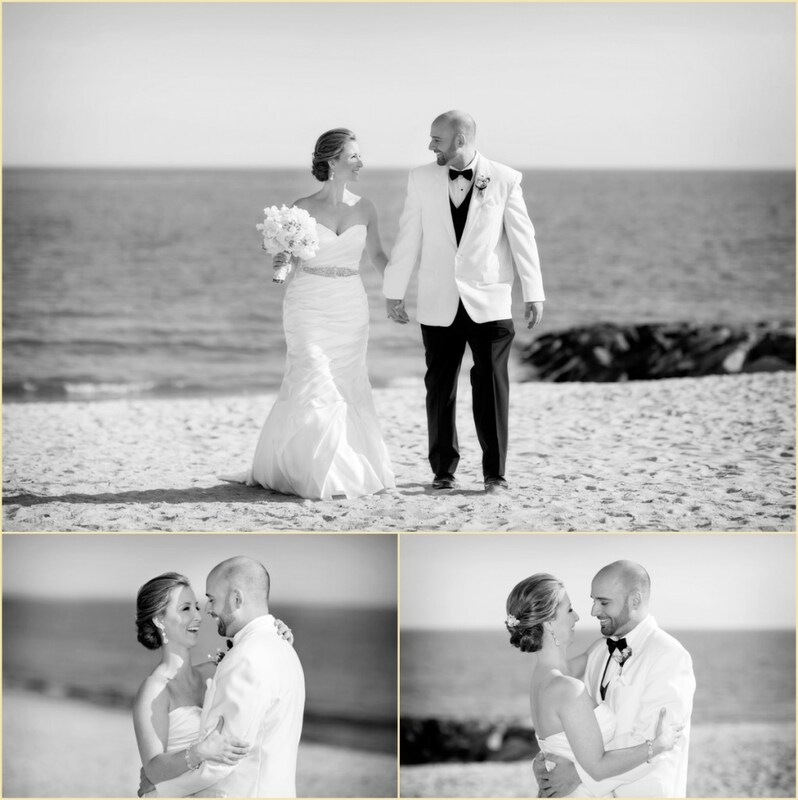 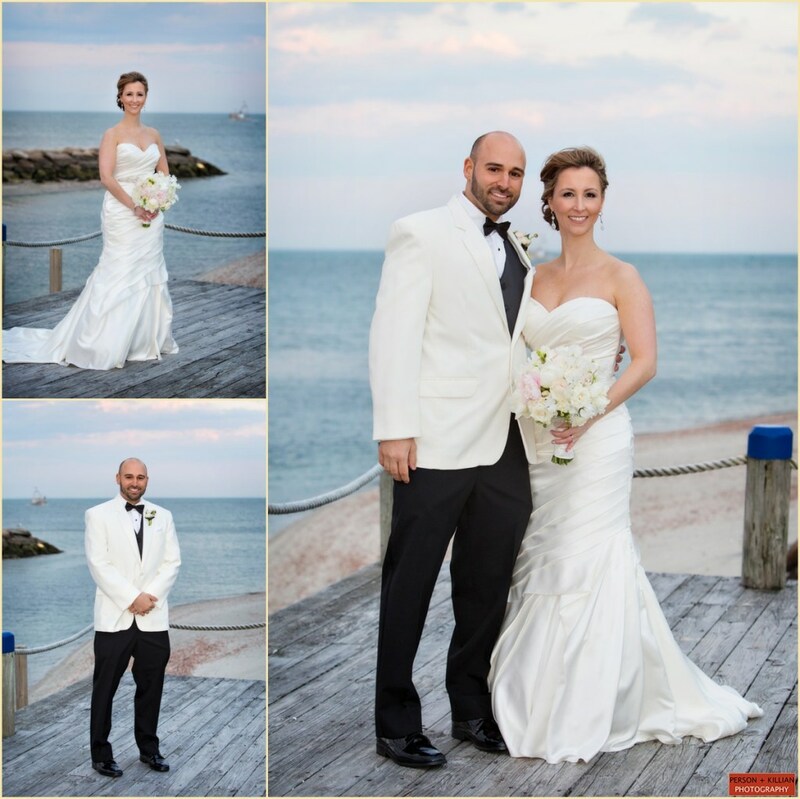 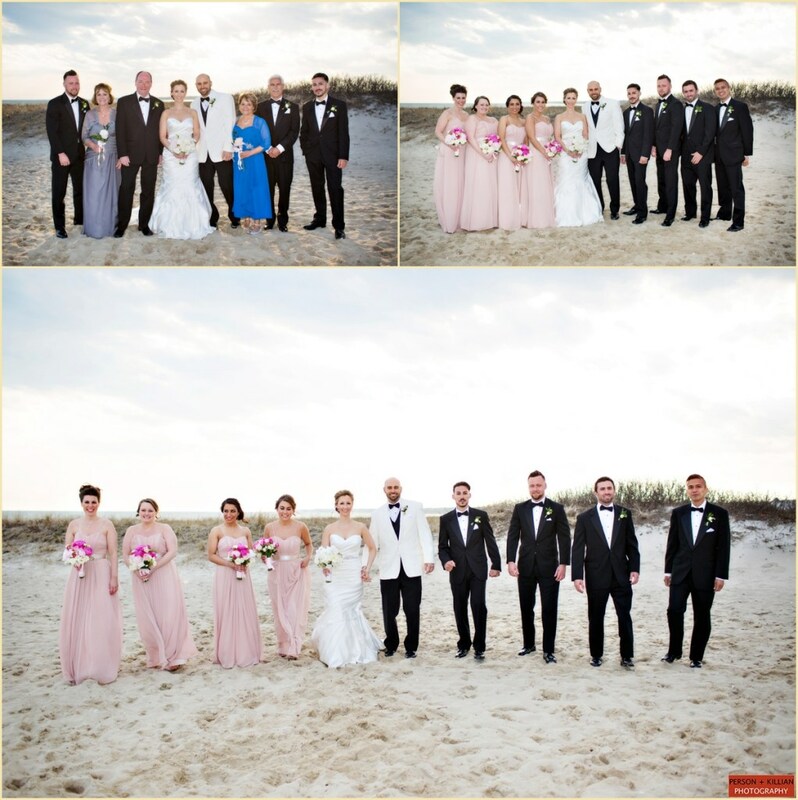 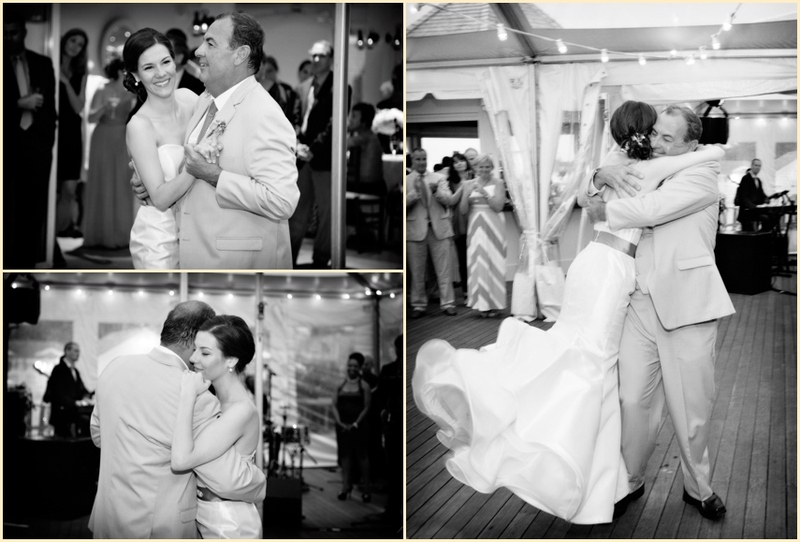 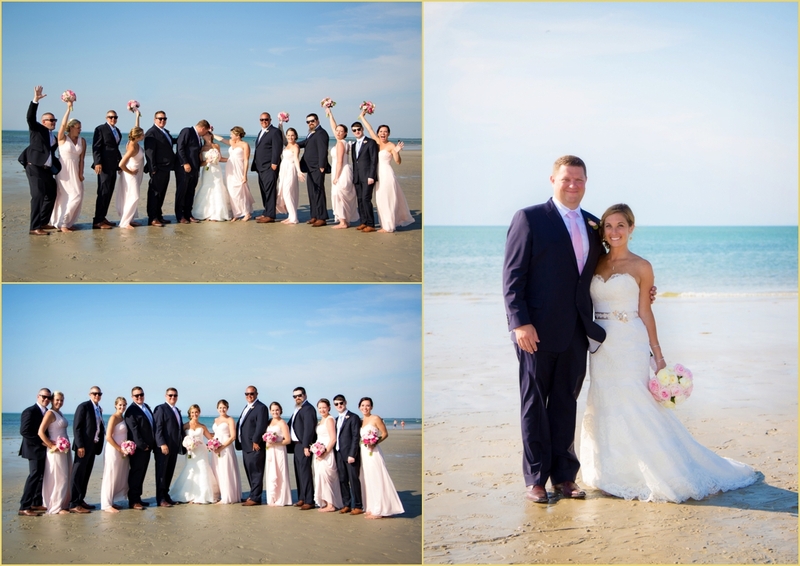 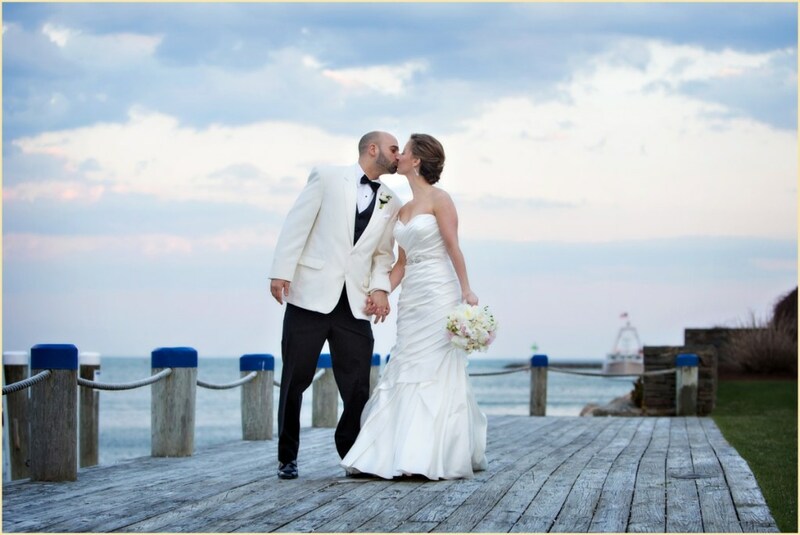 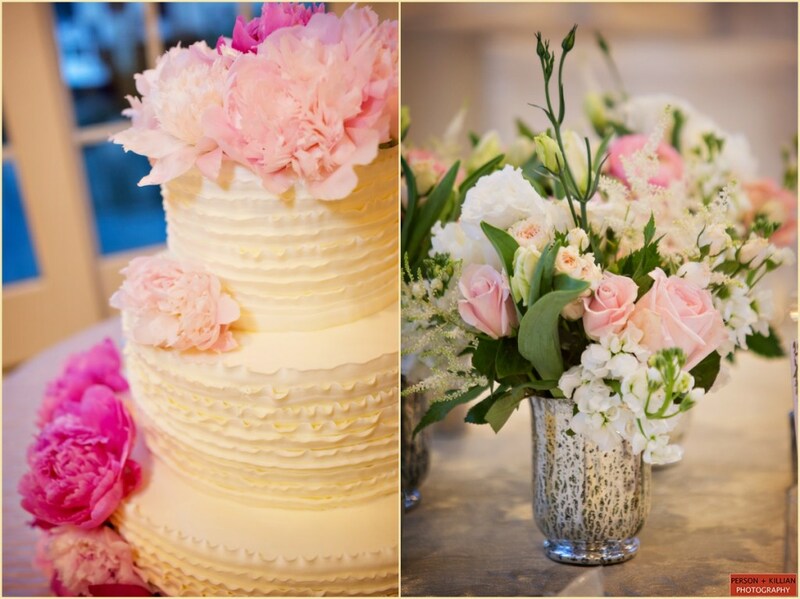 This time, we were there for Laura and Bob’s beautiful seaside affair! 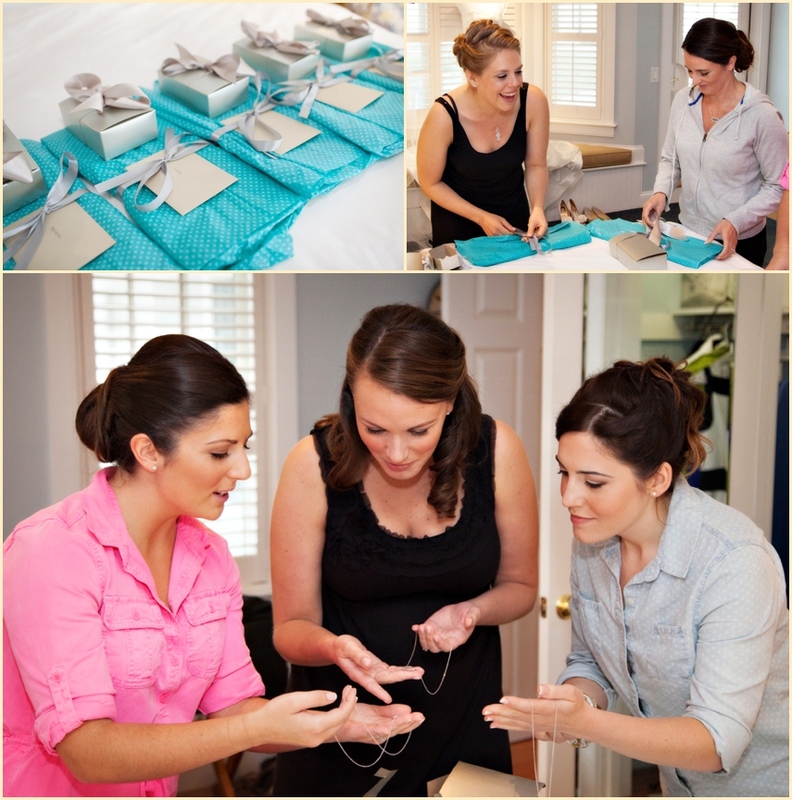 We kicked off the big day at the Inn, where the bridal party got ready. 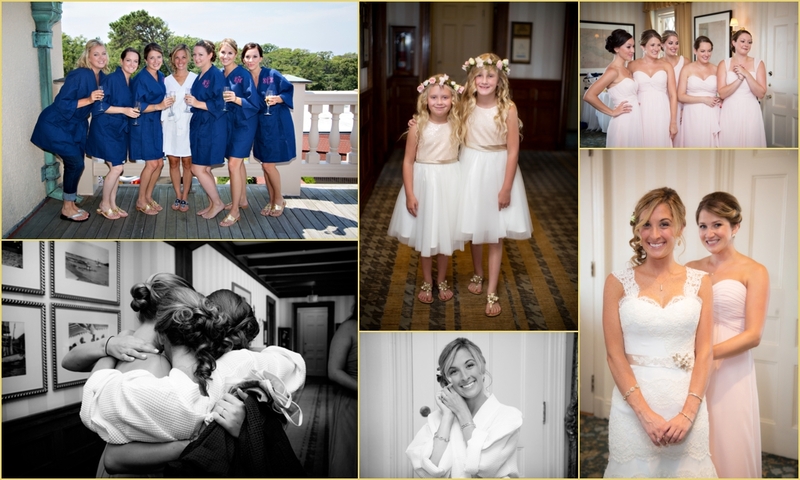 Laura wore her long hair down, and enlisted stylist Amy Hudson to create soft, flowing waves. 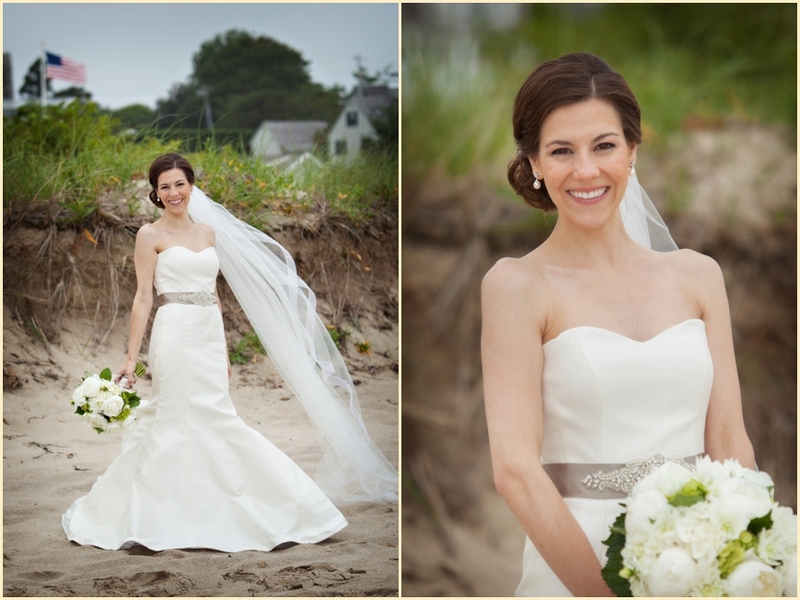 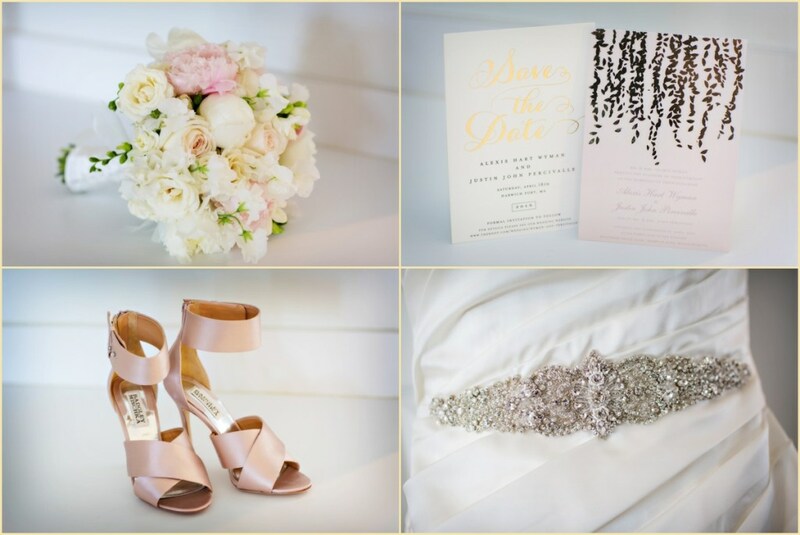 Makeup artist Rebecca Hickey used a light, neutral color palette to give the bride an elegant, yet natural look. 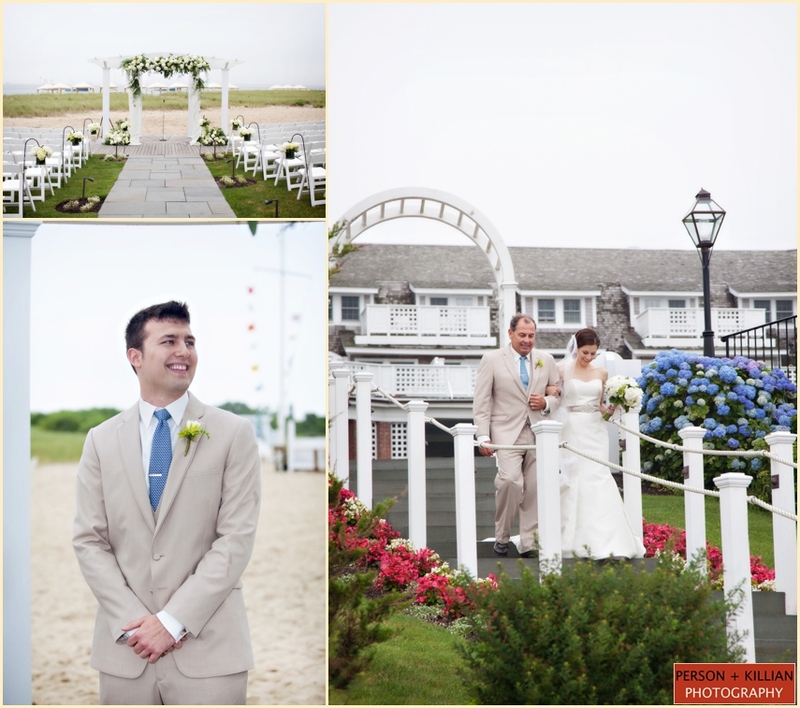 Once the bride had donned her gorgeous Amsale gown, it was time to head to the South Lawn for the beachside ceremony. 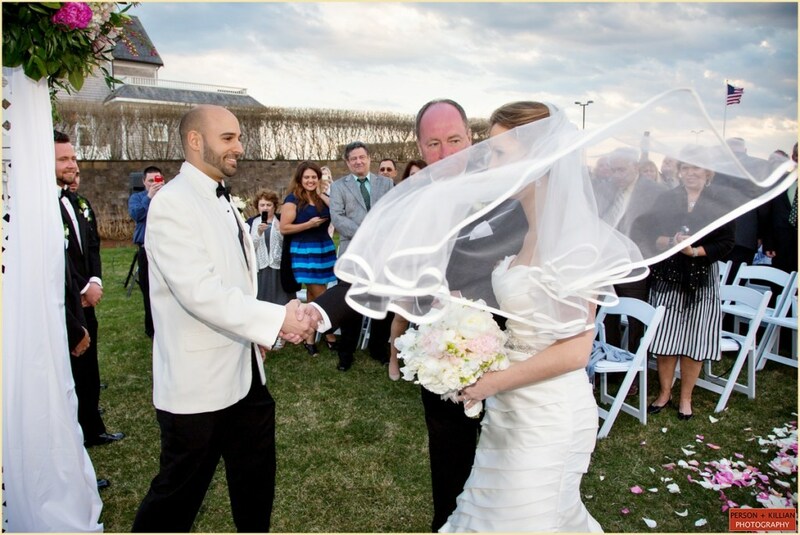 Along with her beautiful white and ivory bouquet by Lilacs, Laura carried an heirloom lace handkerchief, which had been in the family for more than 100 years! 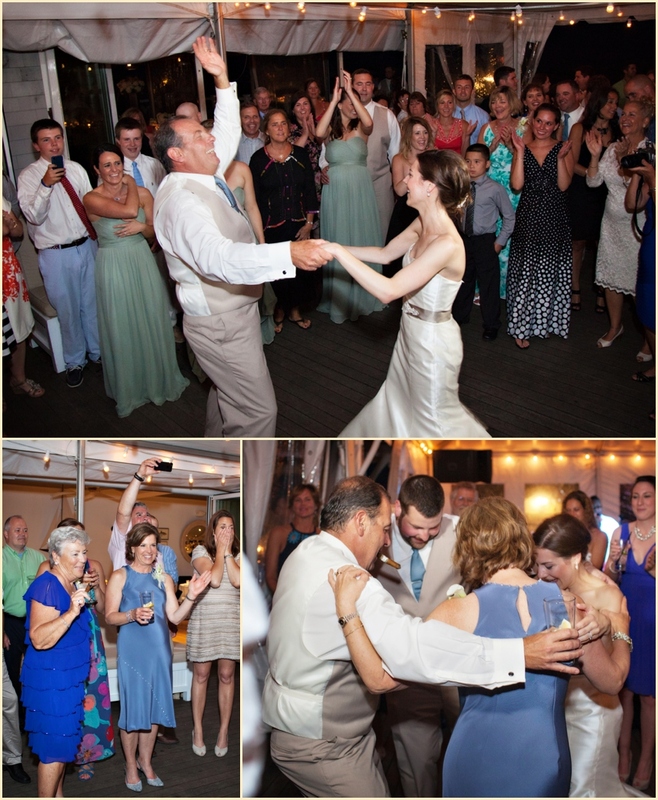 Following the ceremony, the festivities moved to the Boat House for cocktails, and ultimately, to the Beach House for dinner and dancing. 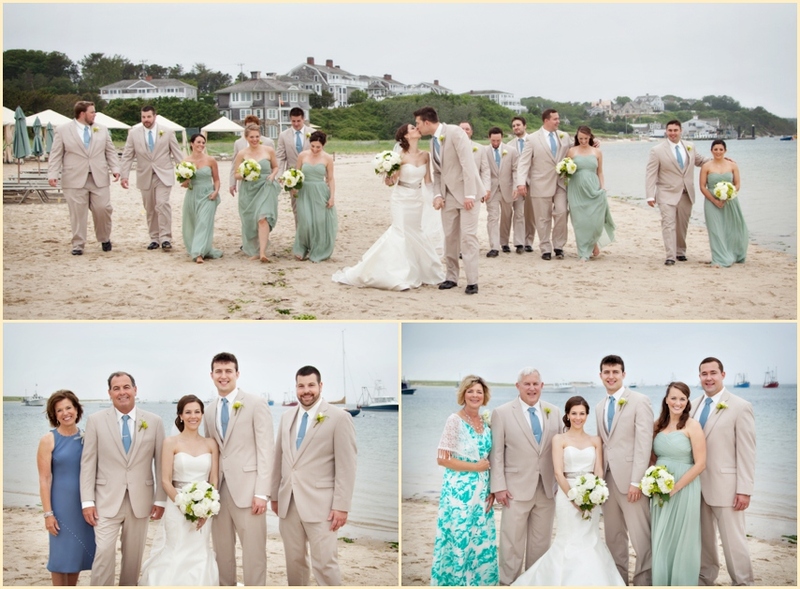 The pale green, ivory, and white color scheme was present throughout the day, and afforded the entire event a beautifully organic, yet distinctly ‘Cape Cod’, feeling. 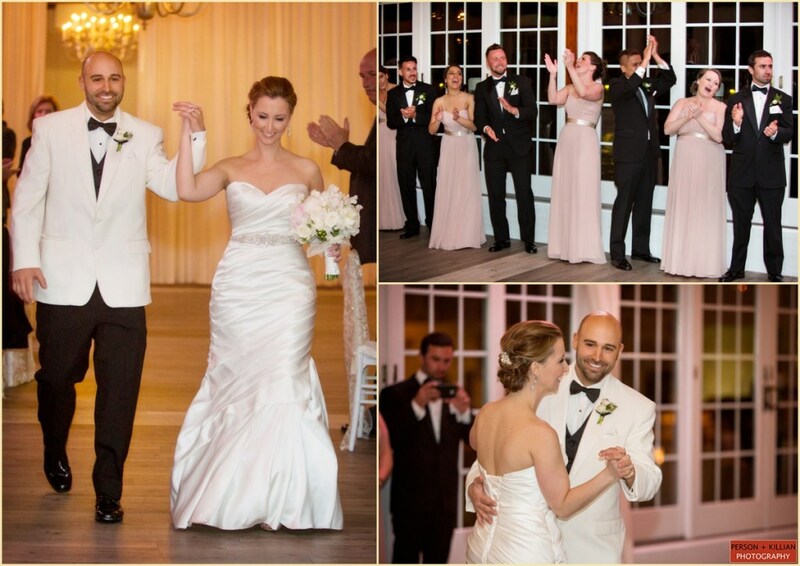 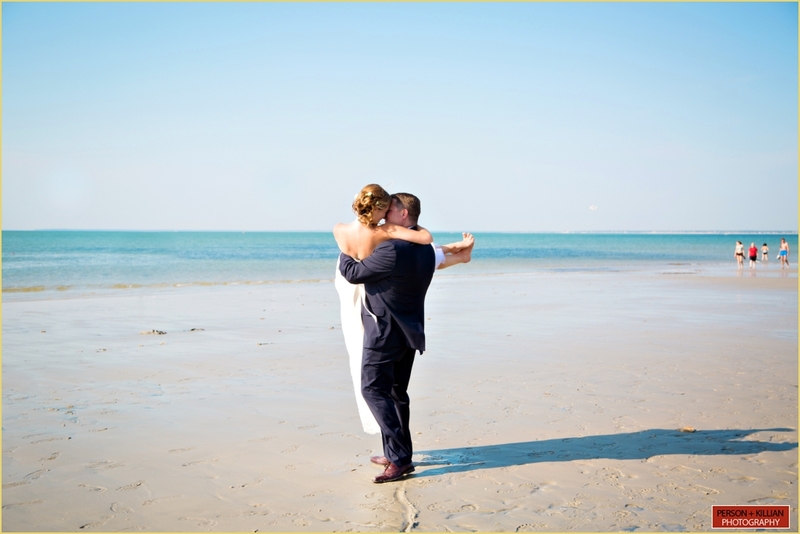 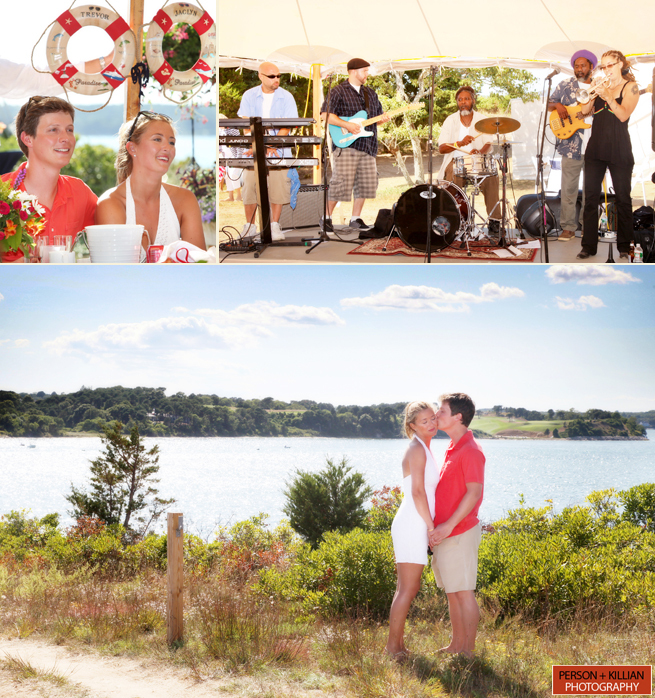 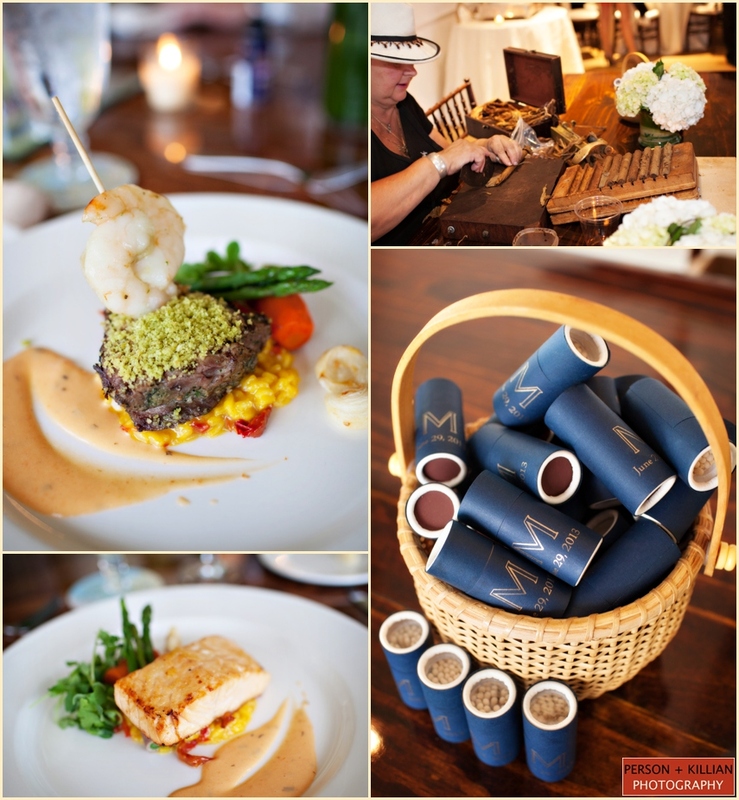 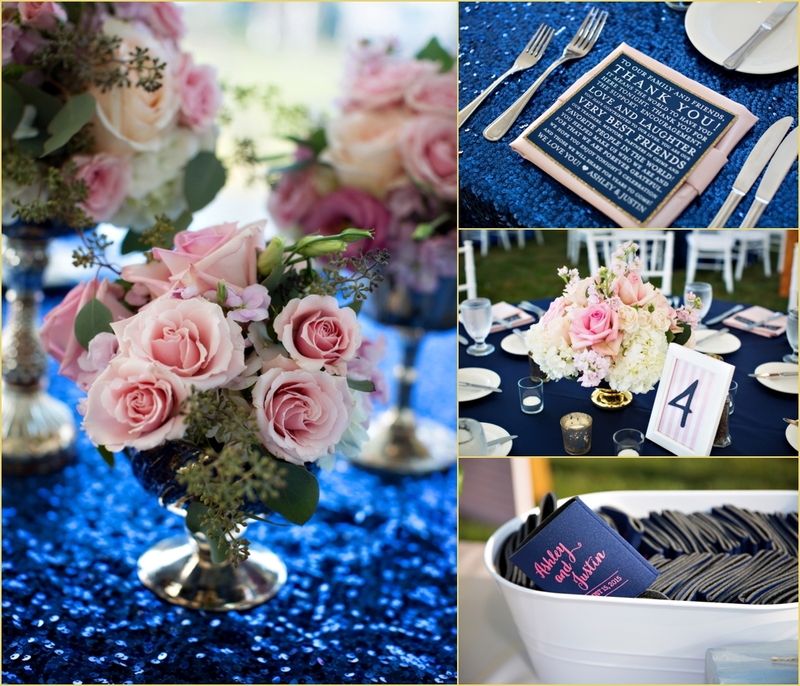 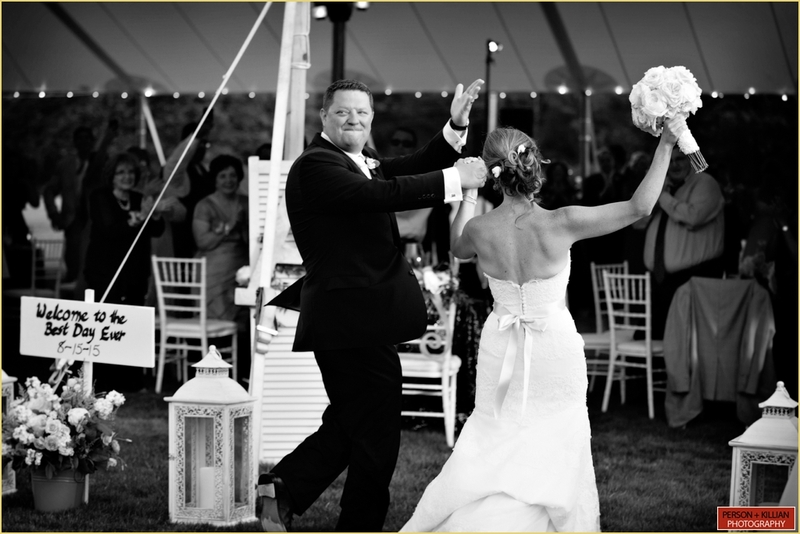 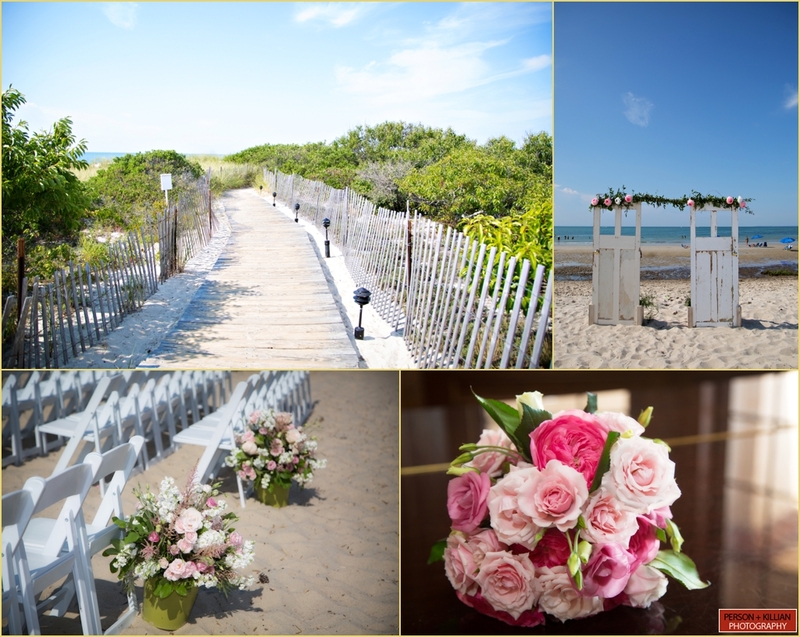 A big thank you to Cape Cod wedding Planner Allison Liset, for once again being such a pleasure to work with! 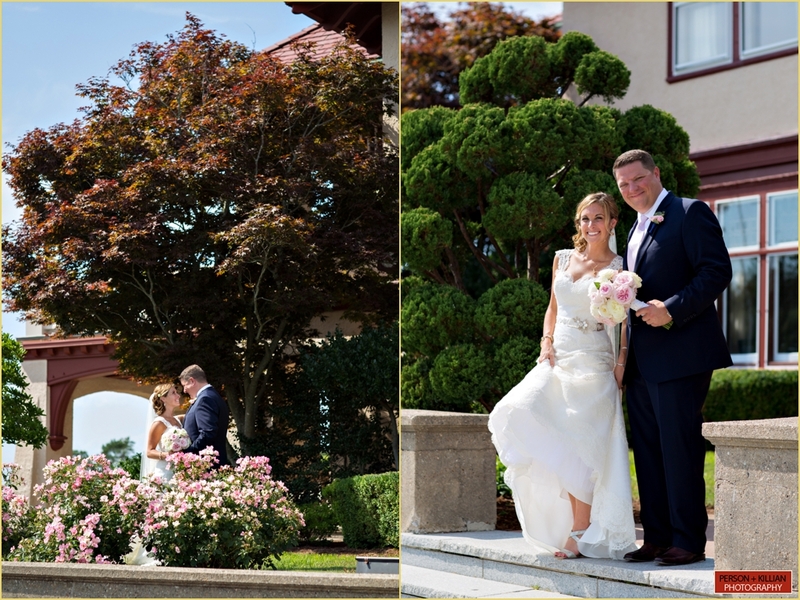 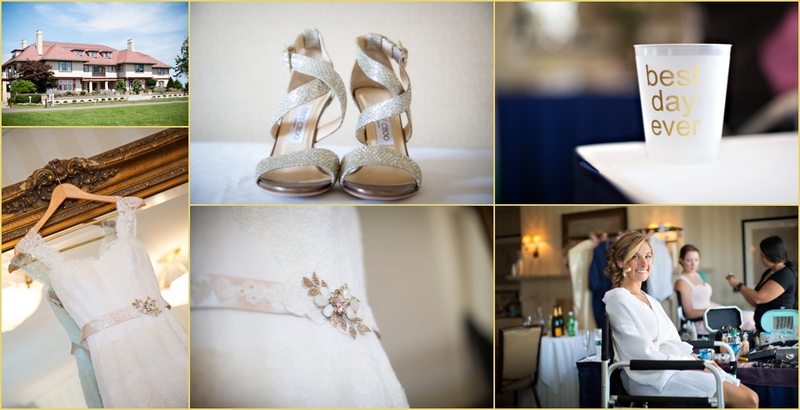 Congratulations Laura and Bob, and thank you for trusting Person + Killian Photography to capture your special day! 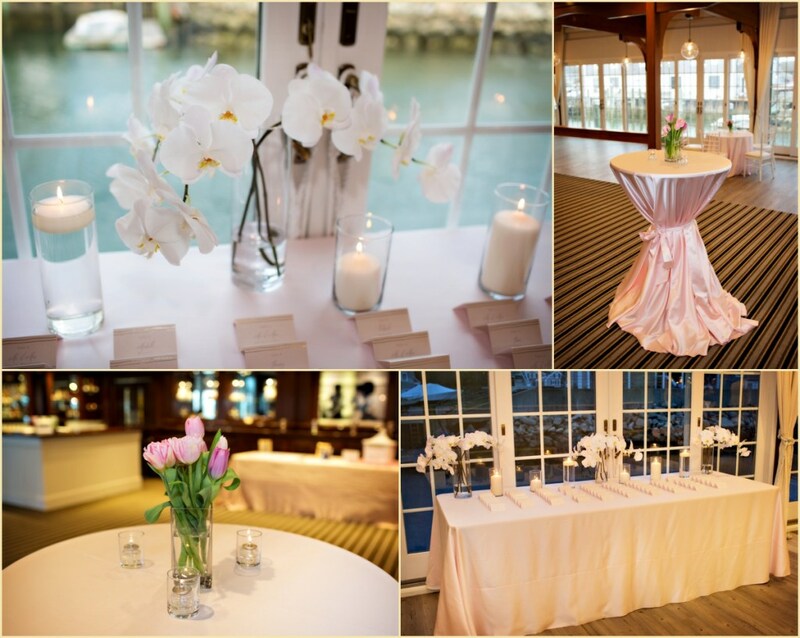 Venue: Chatham Bars Inn; Event Coordinator: Allison Liset; Hair: Amy Hudson; Makeup: Rebecca Hickey; Dress: Amsale; Flowers: Lilacs; Linens: Be Our Guest; Ceremony Music: Intermezzo; Reception Music: Flipside. 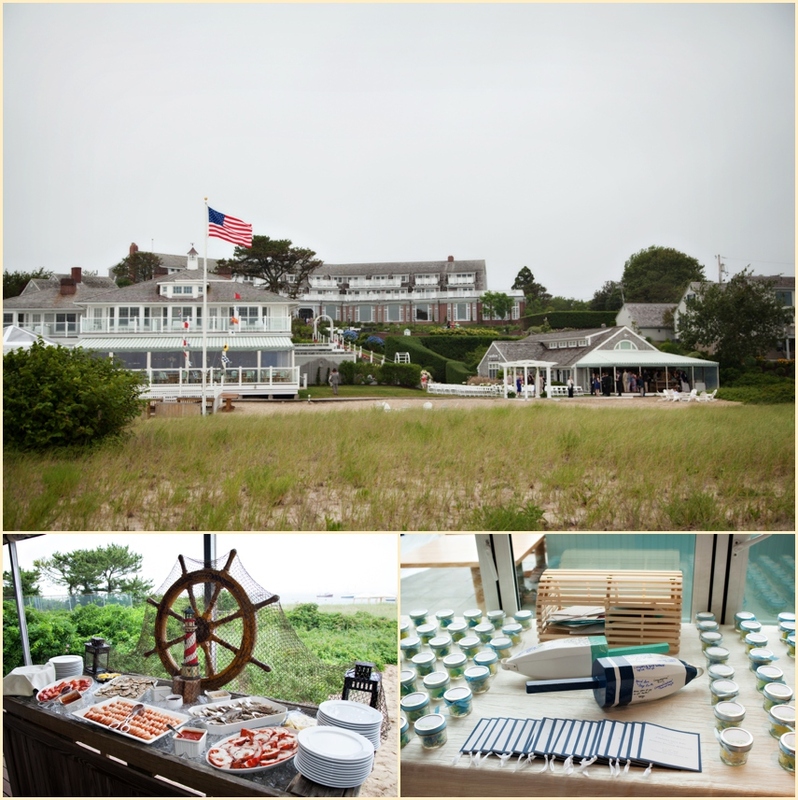 It’s not every day that Person + Killian Photography is asked to photograph a beach party and lobster bake on a private island. 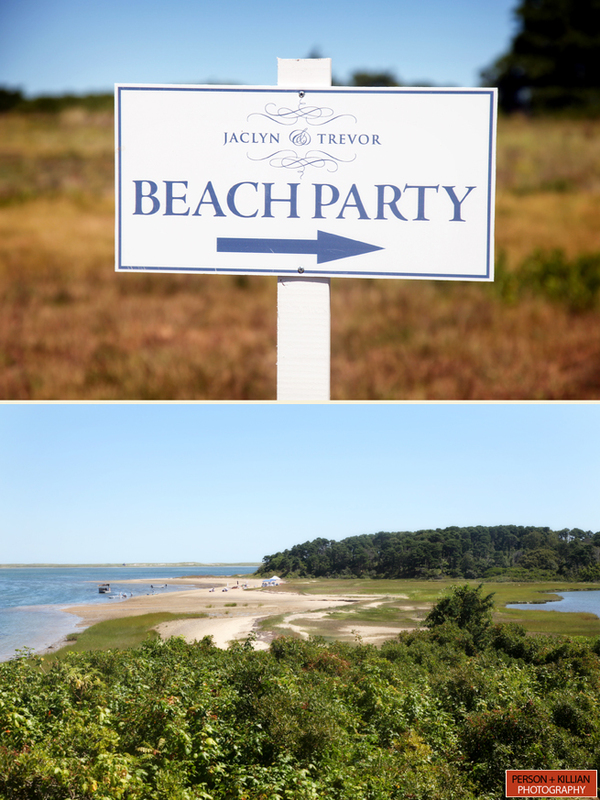 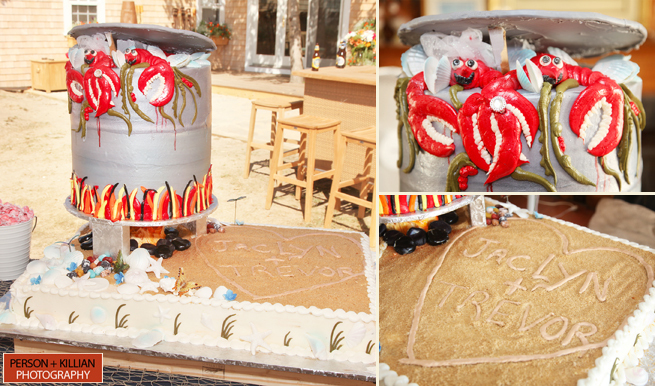 Well, this time we had the opportunity for Jaclyn and Trevor’s pre-nuptial wedding weekend bash. 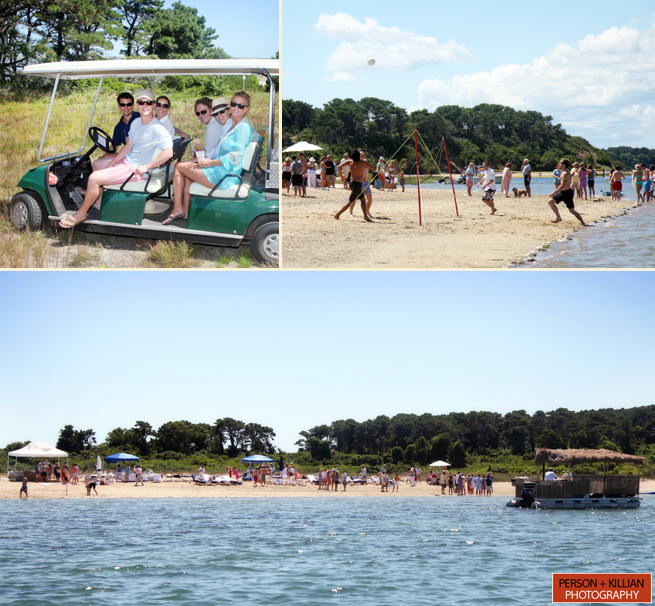 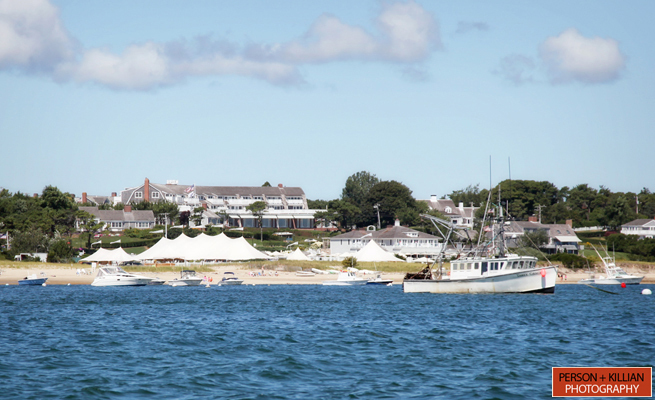 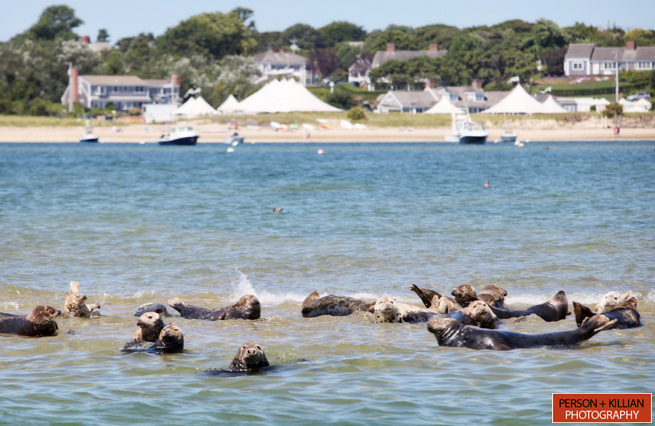 The day started when we hopped on a boat at the Chatham Bars Inn on a perfect Friday morning and headed out on a 20 min boat ride to Strong Island. 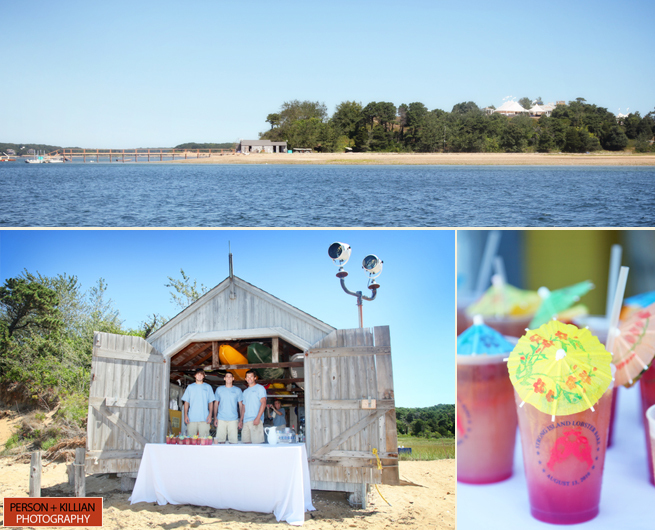 Upon arrival, all guests were greeted at the boathouse with refreshing Island Rum Punch. 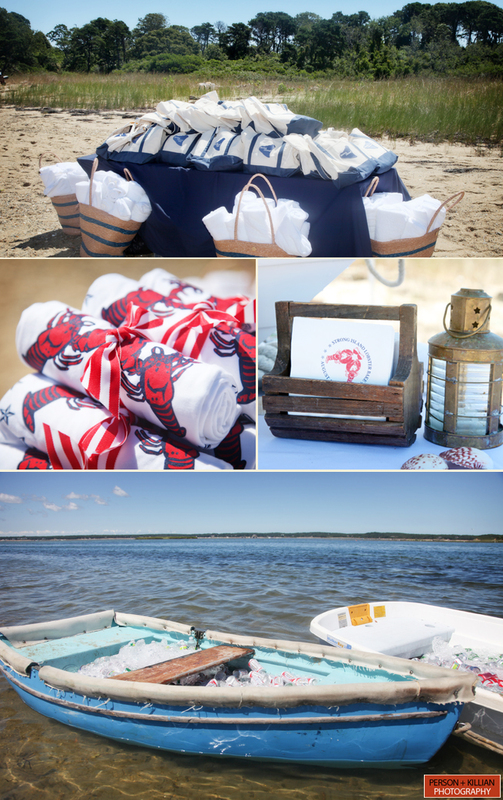 After making our way across the island to the beach, totes were given out that had everything necessary for the perfect day including towels, sun screen, mist spray and more. 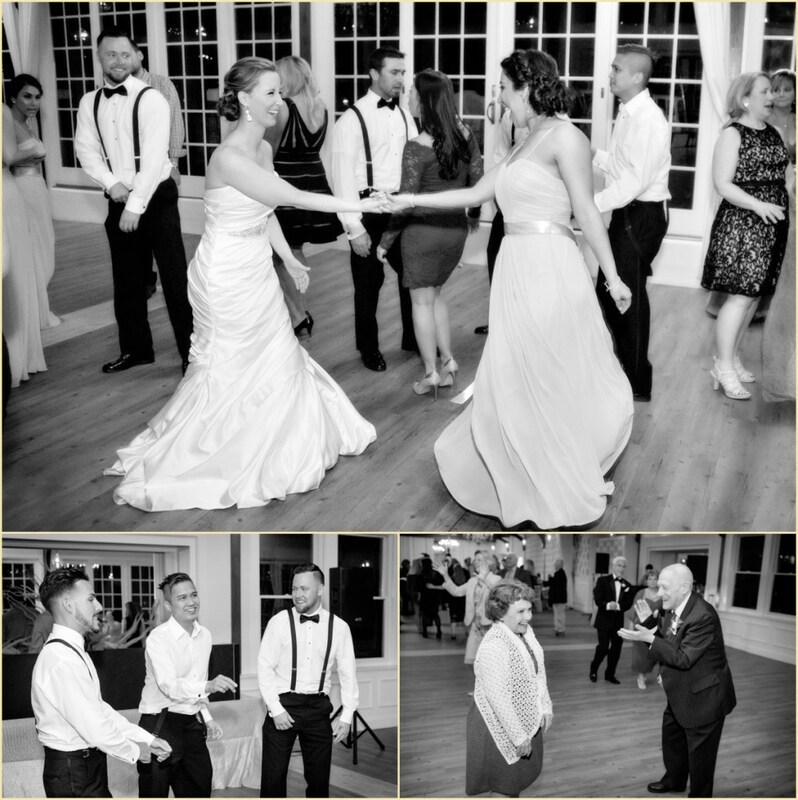 For the next couple of hours, guests partied it up complete with a raw bar, water sports, boats full of iced cold beverages and even a DJ spinning from a tiki boat in the water! 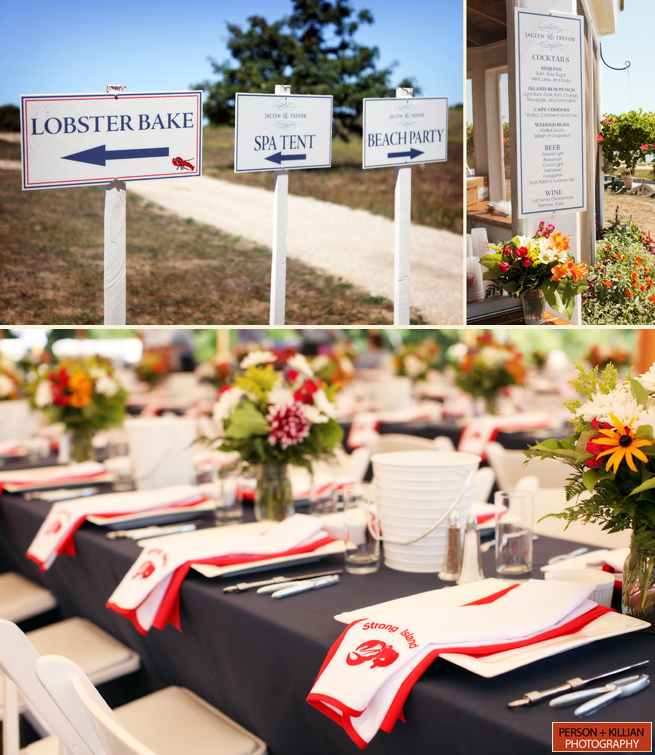 From there it was off to the spa tent before heading over to the lobster bake. 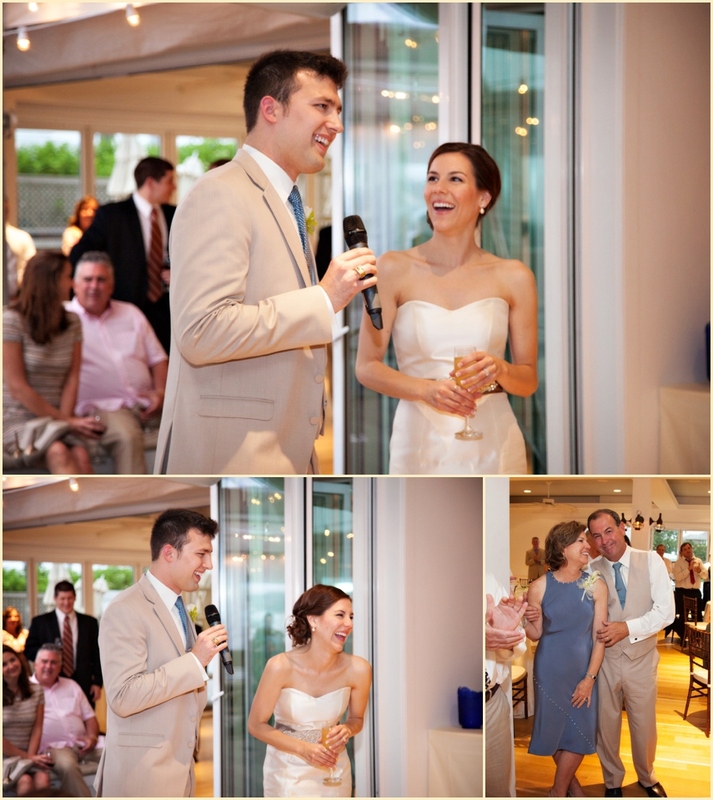 The remainder of the afternoon was complete with an authentic reggae band, Mojitos and even the signature “Wedded Bliss” cocktail. 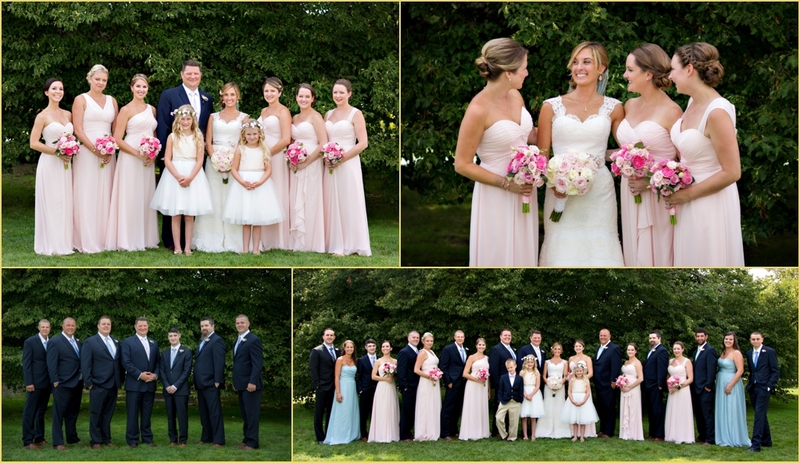 Person + Killian wedding photographers clearly captured the elation of former Boston Bruin and current goalie for the Toronto Maple Leafs, Andrew Raycroft, his bride Erin, + their very handsome gaggle of attendants.